The items listed on the page are not for sale, so please don't ask. 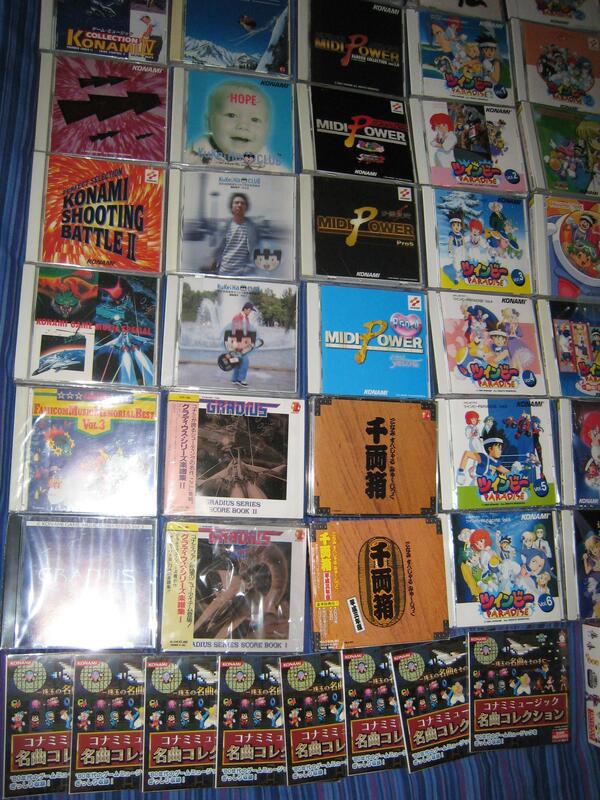 This section is just to show off the collection, to show what's out there and to stop me buying the same thing twice! 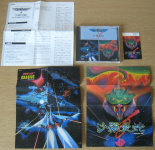 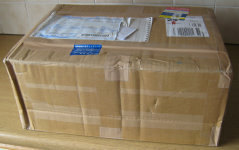 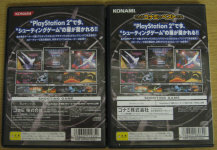 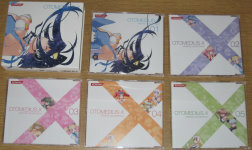 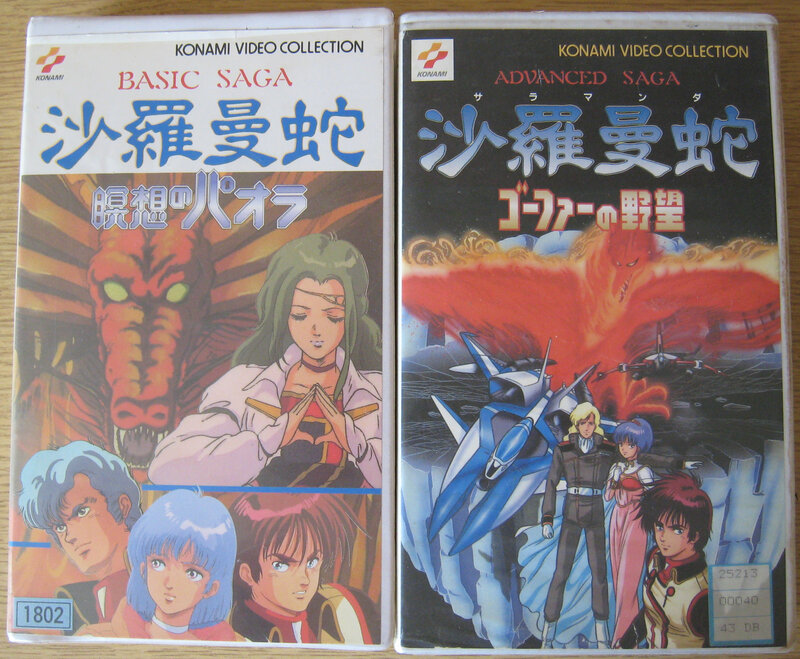 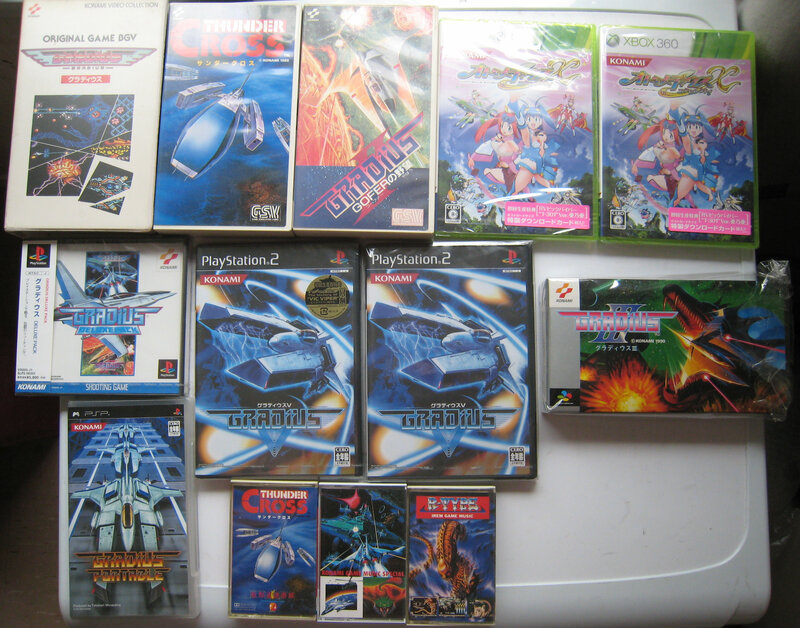 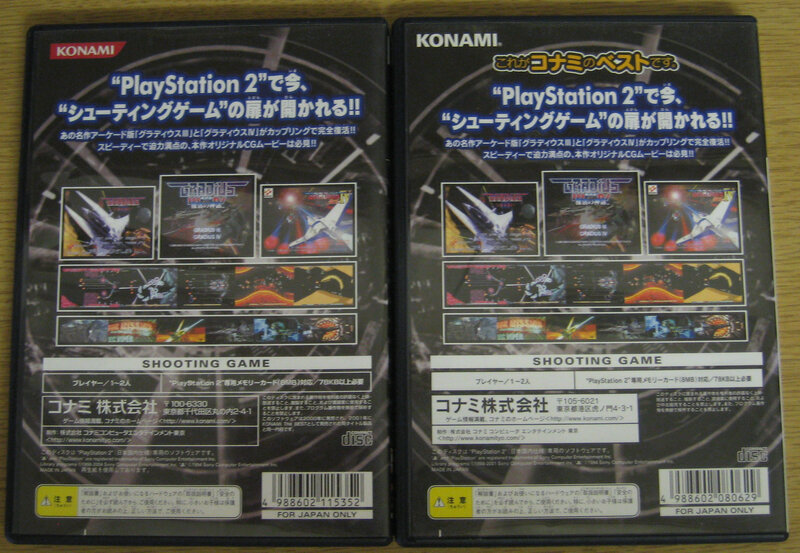 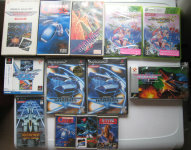 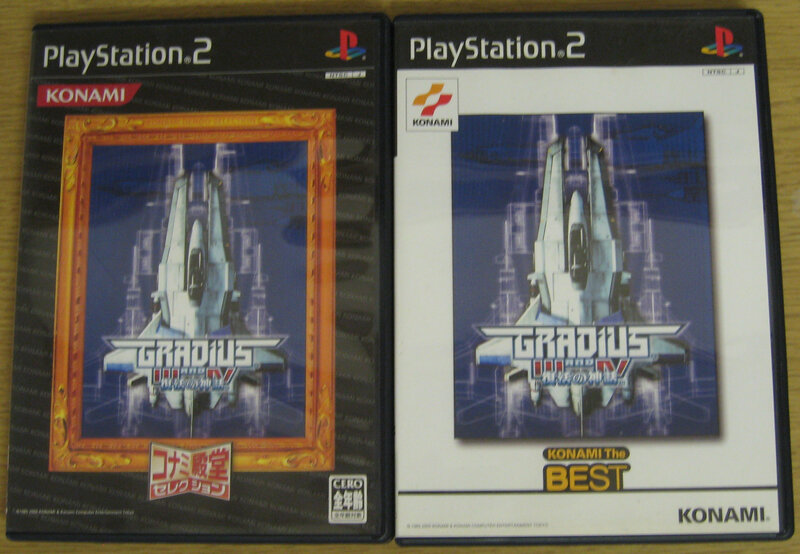 Original Game BGV Gradius, Thunder Cross GSV, Gradius II GOFER no Yabou GSV, Two copies of Otomedius X factory sealed. 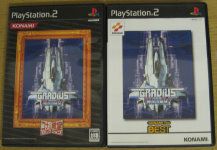 Gradius Deluxe Pack PlayStation, Gradius V PS2 Pre order, Gradius V PS2 standard all factory sealed, mint condition Gradius III Super Famicom. 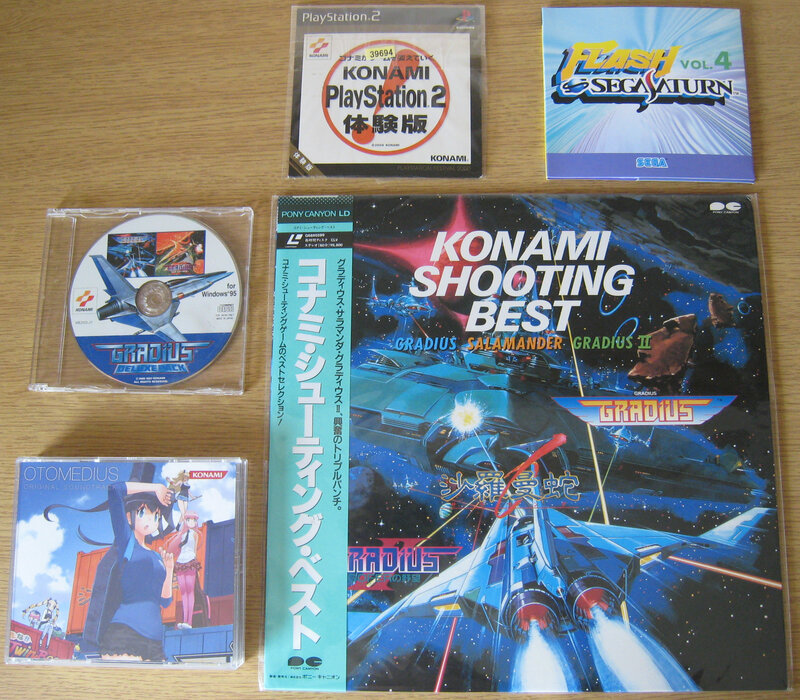 Gradius Portable PSP, Thunder Cross, Konami Game Music Special and R Type Cassettes, I only got R Type for as it was cheap and didn't add any thing to the shipping costs. 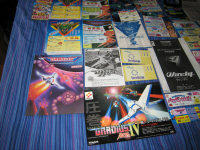 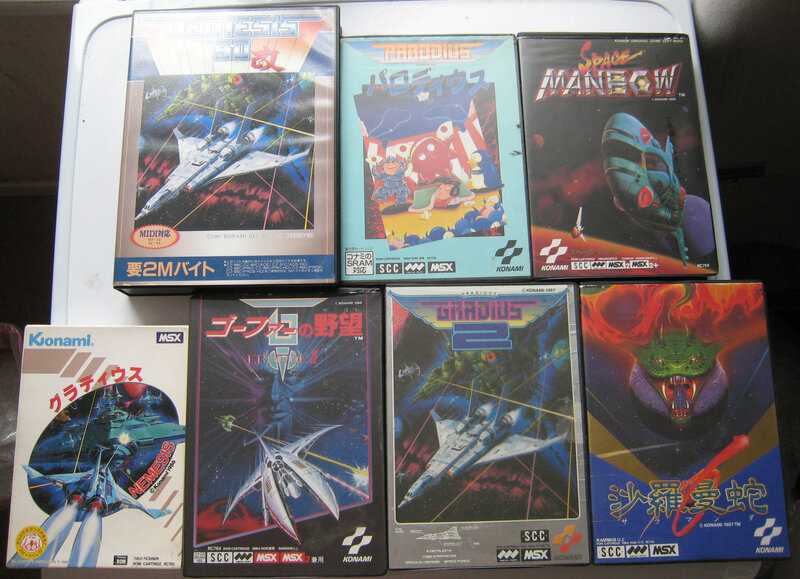 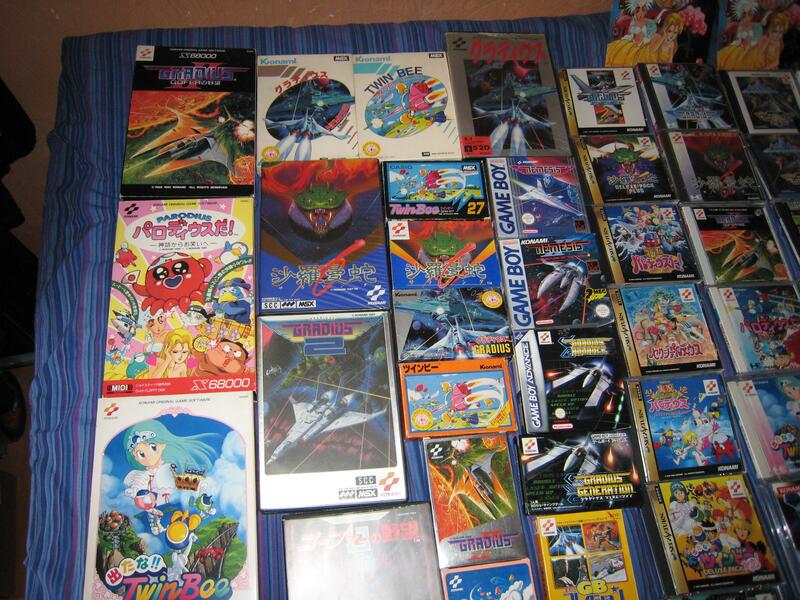 Seven MSX games, Nemesis 90 Kai, Parodius, Space Manbow, Gradius, GOFER no Yabou Episode II, Gradius 2 and Salamander. 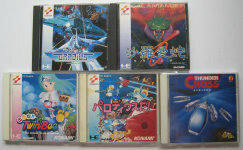 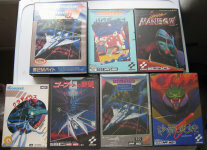 Four PC Engine games, Gradius, Salamander, Detana!! 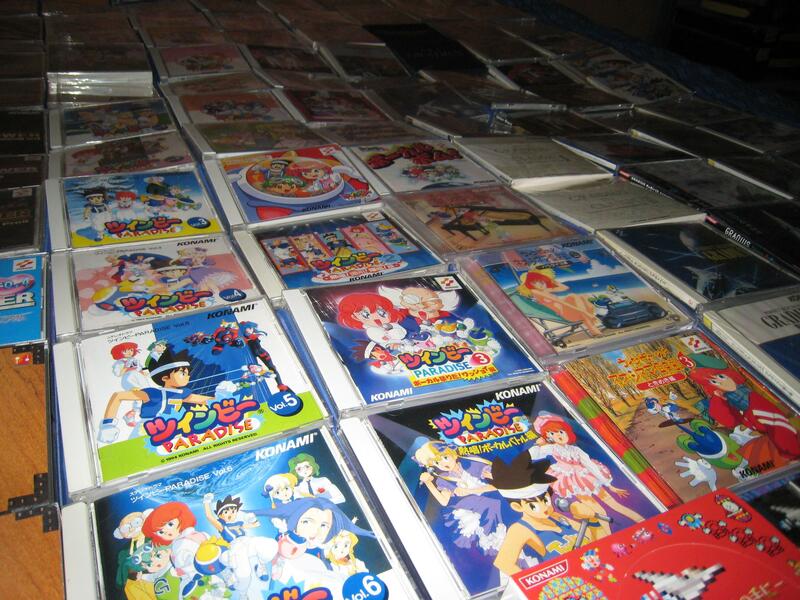 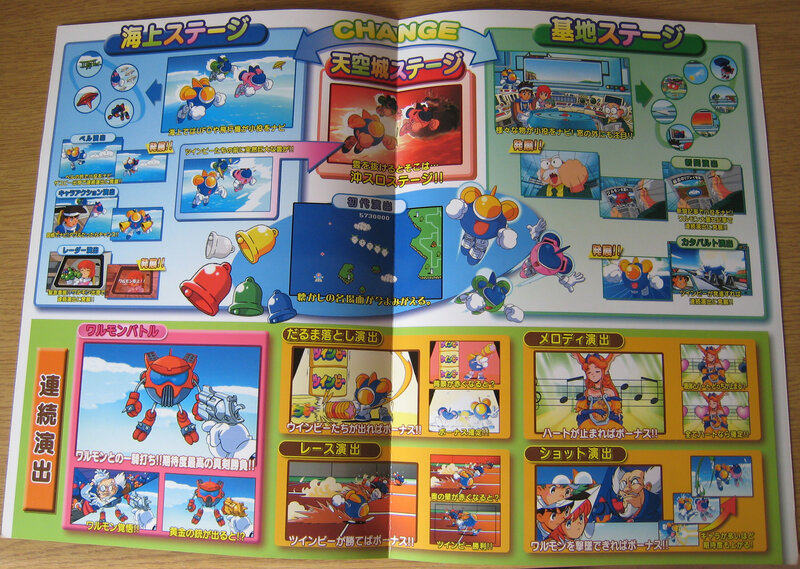 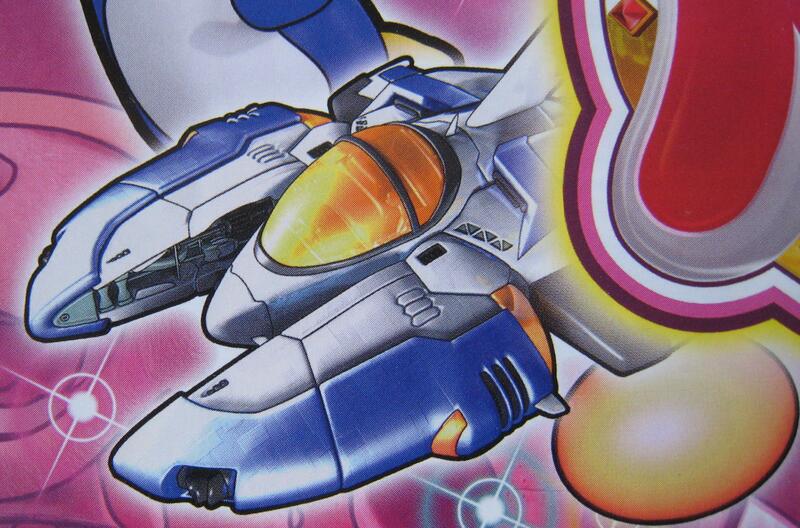 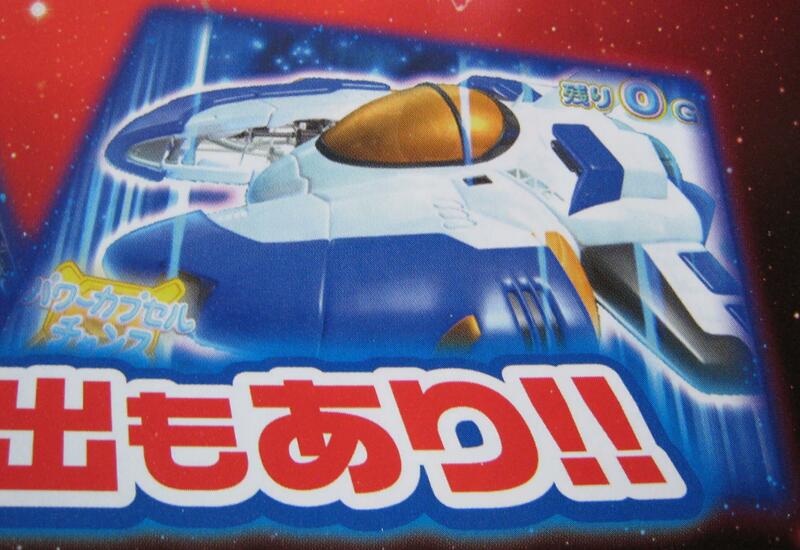 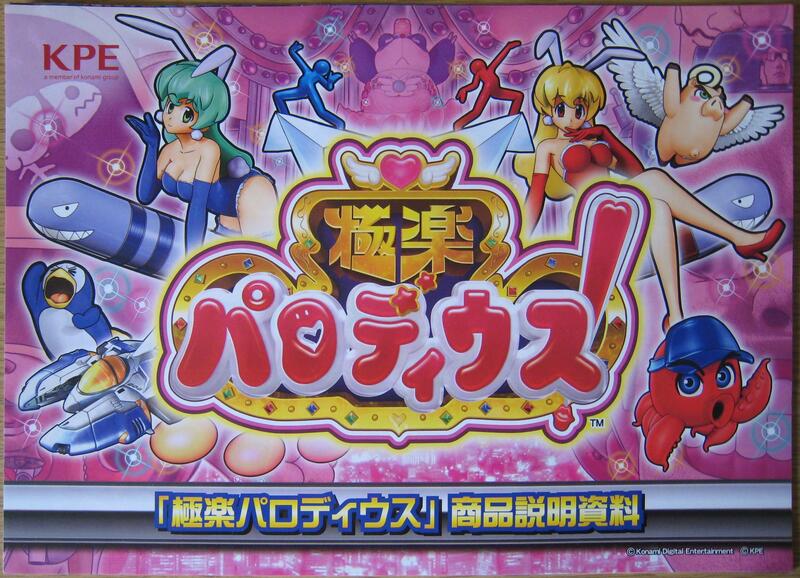 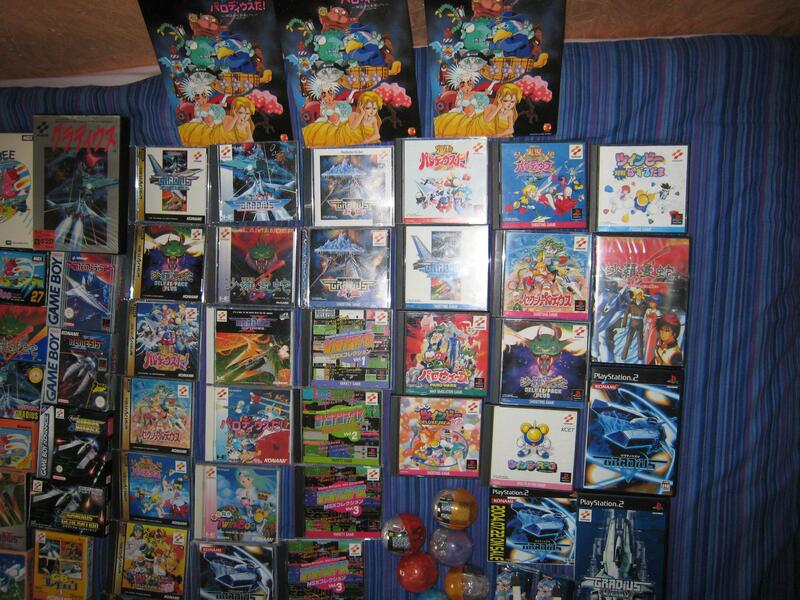 TwinBee, Parodius da! 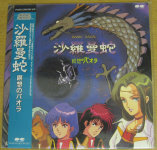 and the Thunder Cross Music CD. 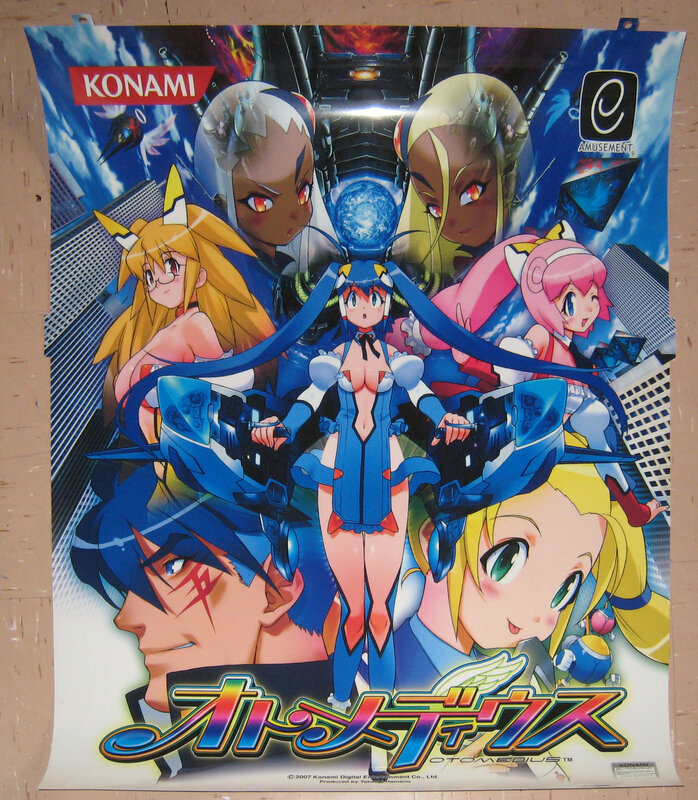 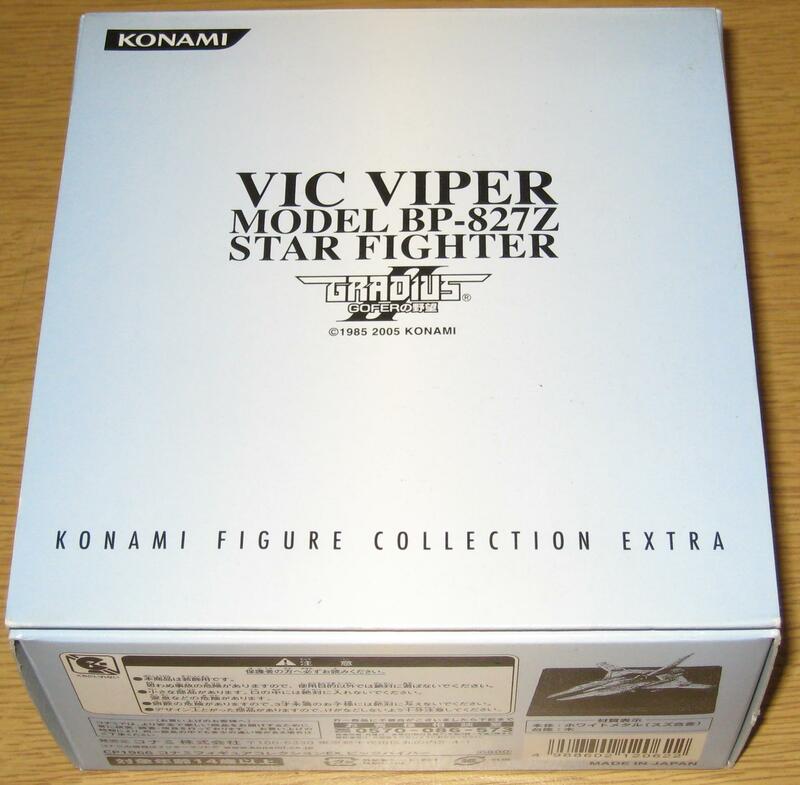 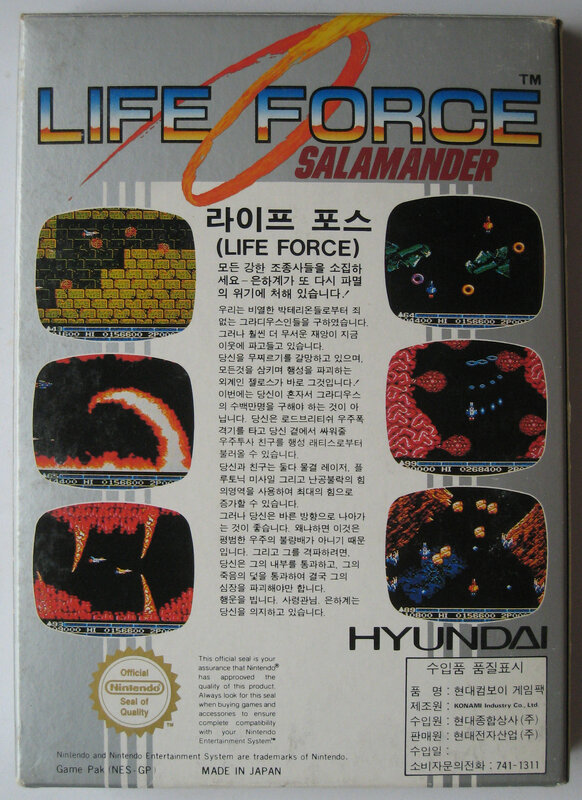 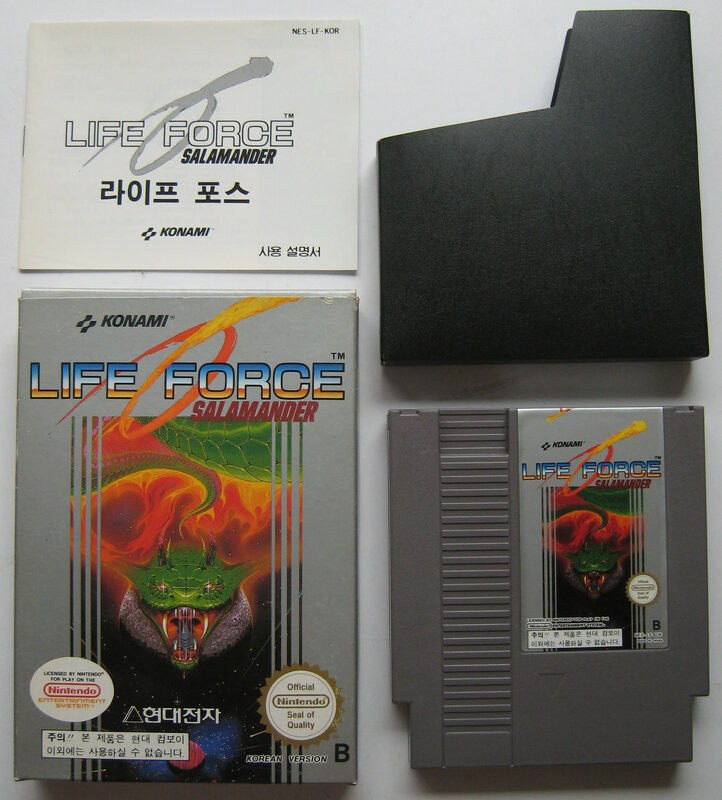 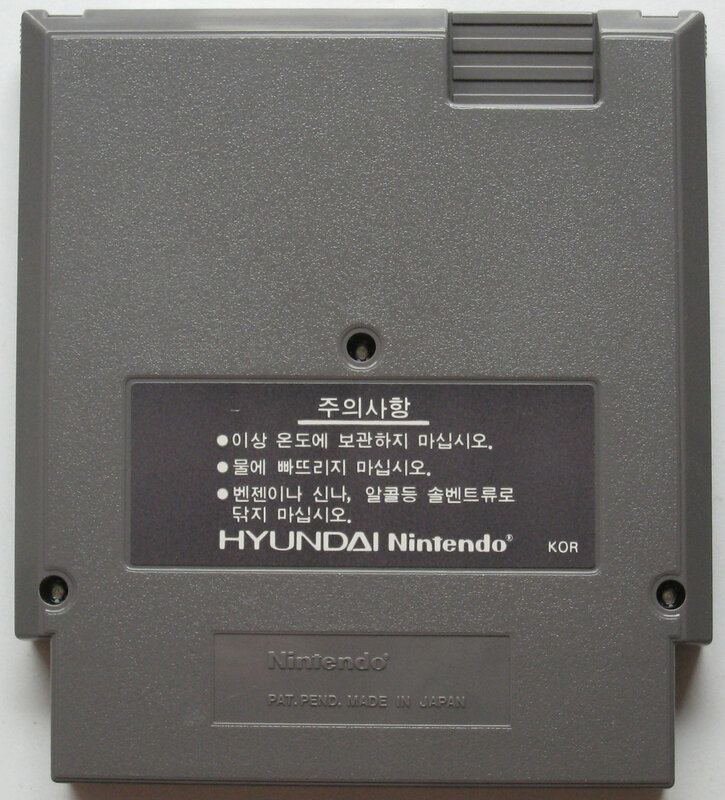 Here's an odd one I was not expecting, I bid on an overseas version and the images were a little small so I though it was the US version but turned out that it's the Korean Version made by Hyundai and Konami. 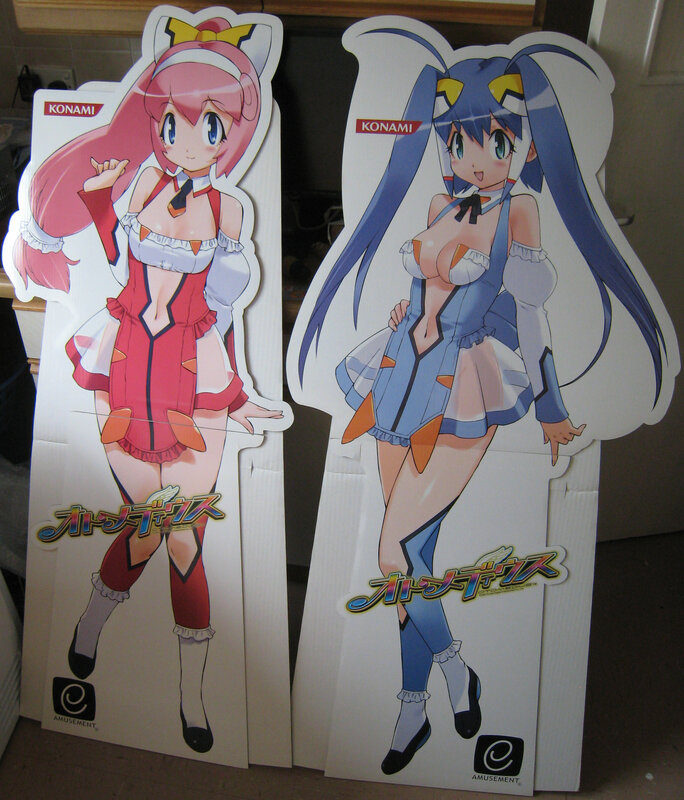 These are life size displays for the arcade game. Top marquee and box label. 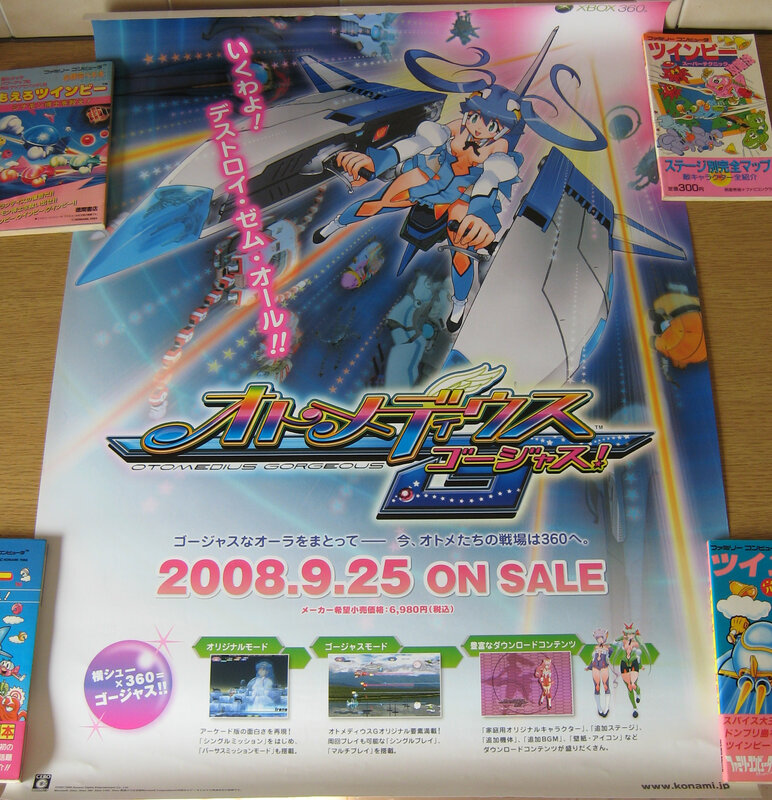 Shop display to advertise the Xbox 360 game. The hard to find Solar Assault Operators Manual. Konami Windy II JVS bottom board and loom, Xexex Flyer, Pair TwinBee Instructions, Otomedius Arcade Marquees (Anoa and Tron, yes another pair), TwinBee (DiskSystem), Otomedius arcade figures and Otomedius Keyrings x5 (Aoba Anoa, Erul Tron, Emon 5, Madoka and Diol Twee), three Parodius Super Famicom games (they were cheap). The Best and Other Versions. 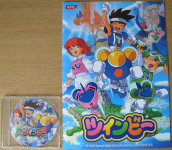 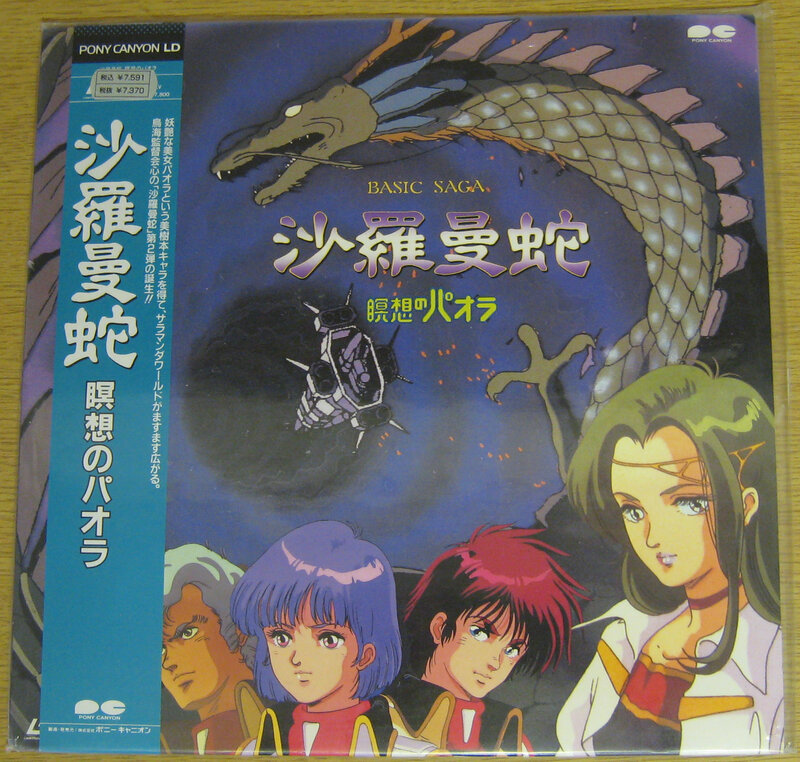 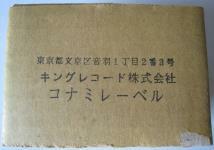 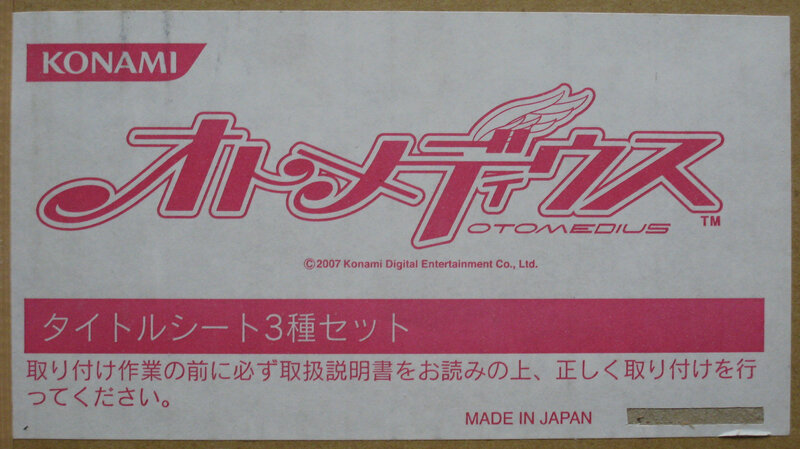 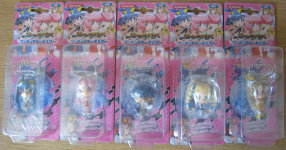 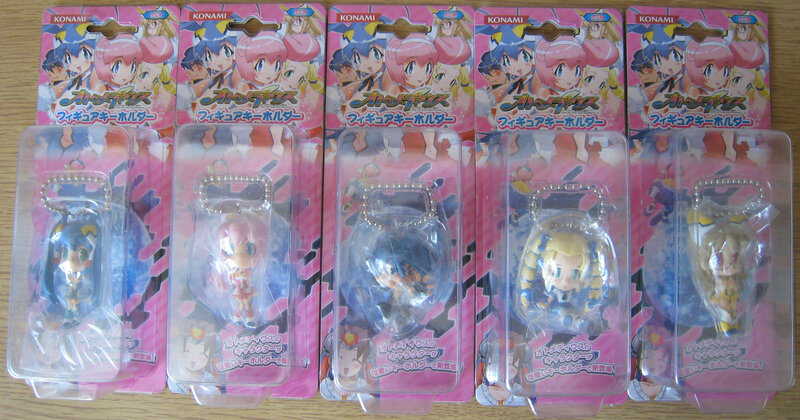 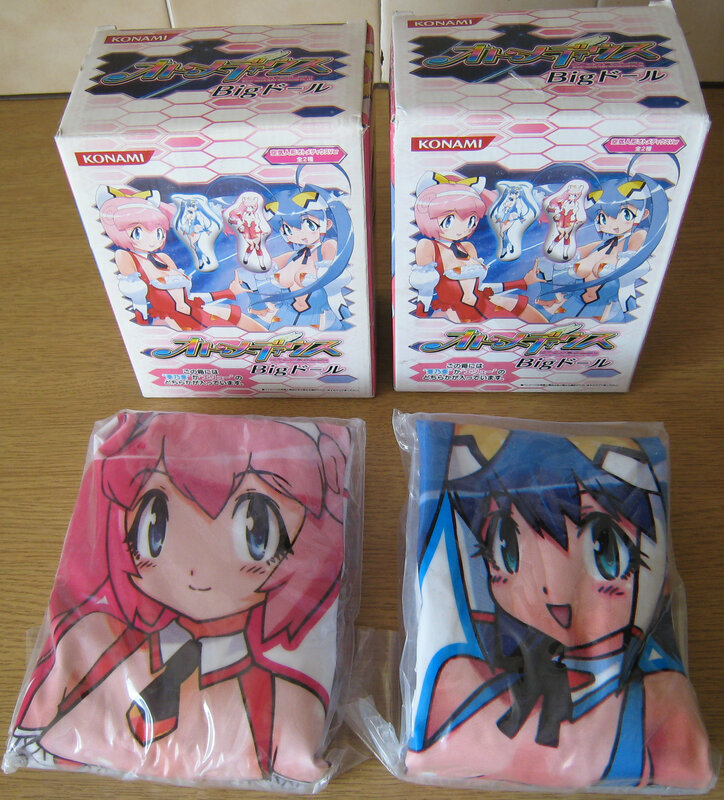 Basic Saga Salamander Meisou No Paora 2nd Series LD (unopened). 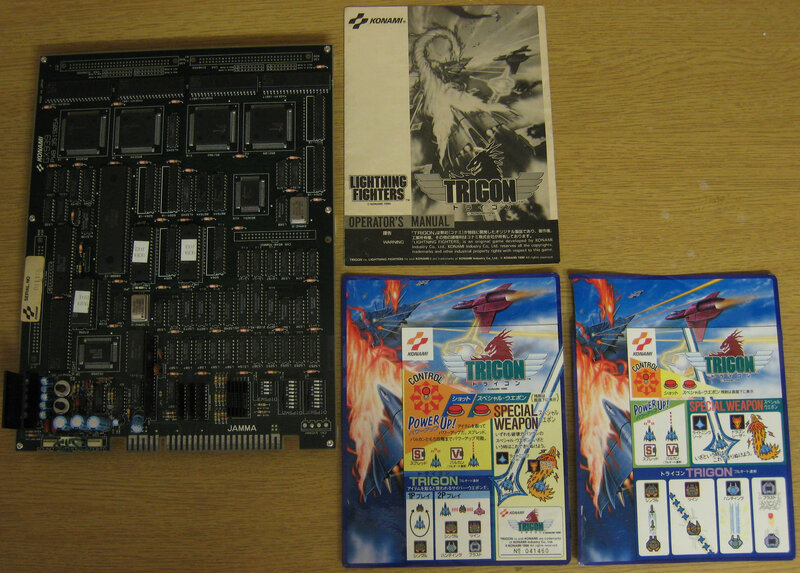 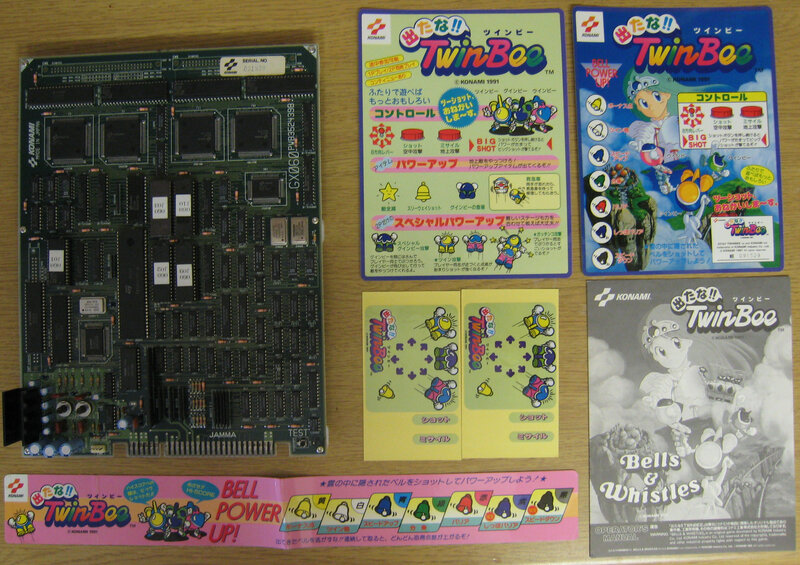 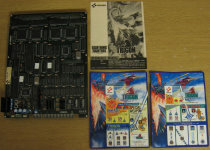 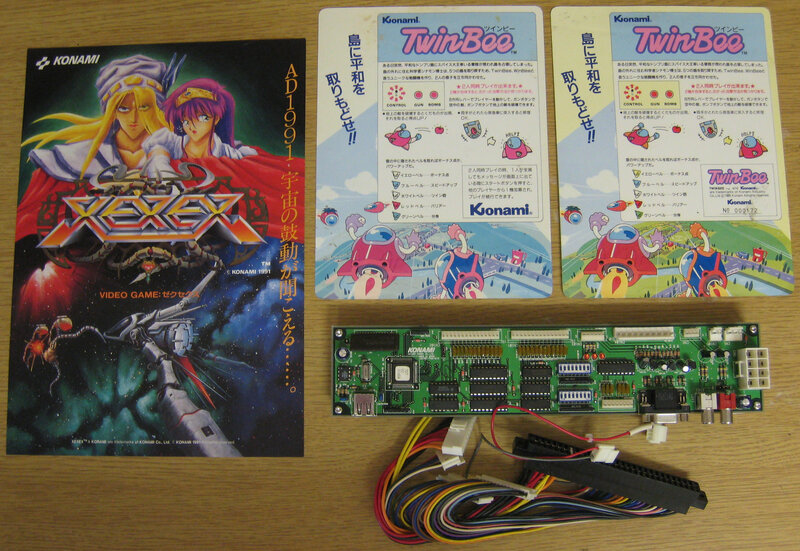 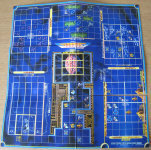 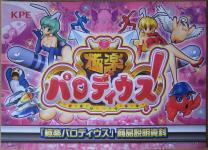 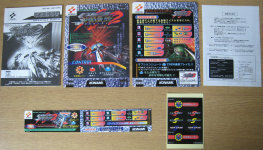 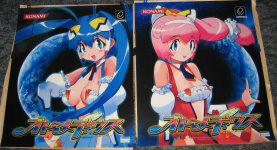 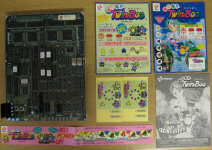 Trigon Arcade PCB, Detana TwinBee Arcade PCB x2, Salamander 2 Arcade PCB, TwinBee Yahoo-!! 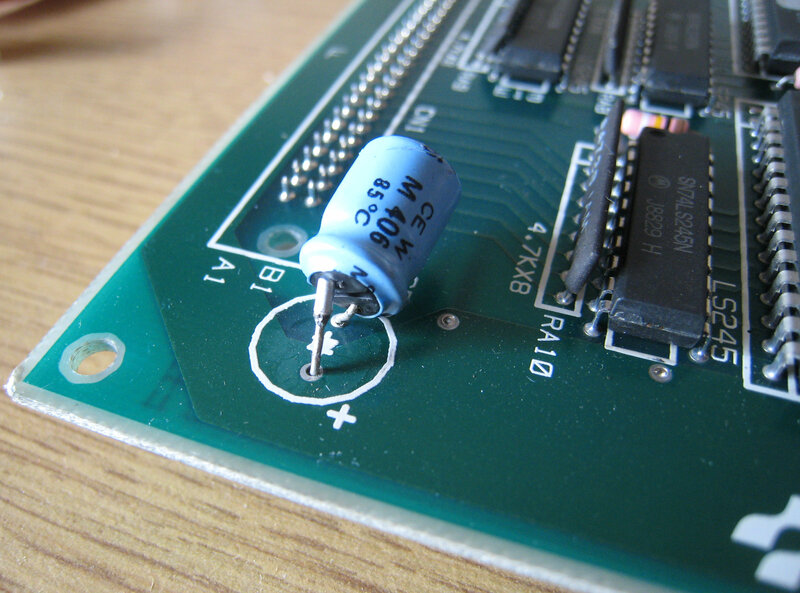 Arcade PCB. 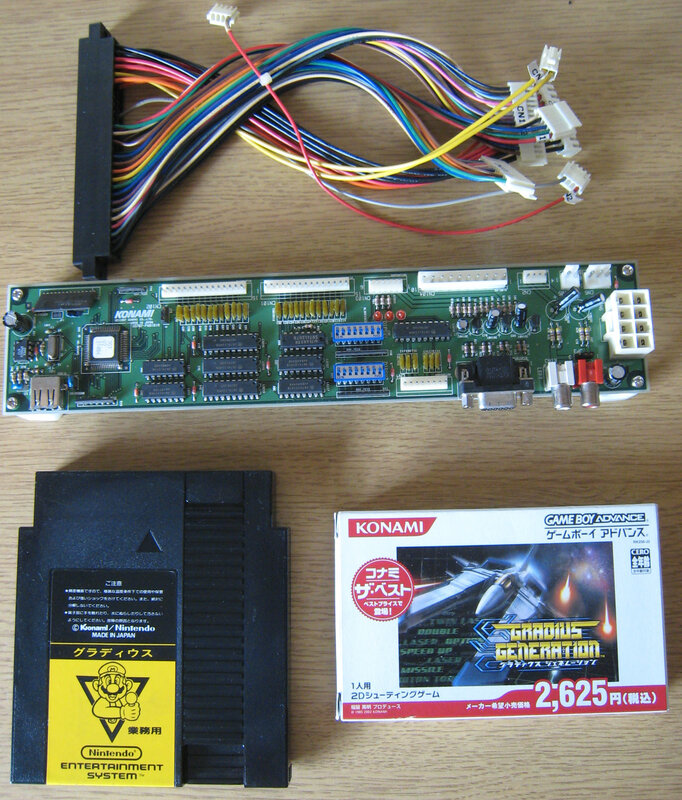 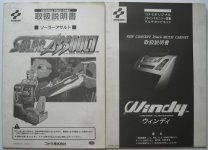 Konami Windy II JVS bottom board and loom, Gradius Generations, Nintendo FamicomBox Gradius, Otomedius Arcade Marquees (Anoa and Tron), Thunder Cross Arcade PCB. 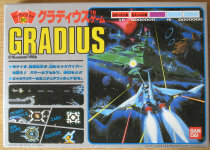 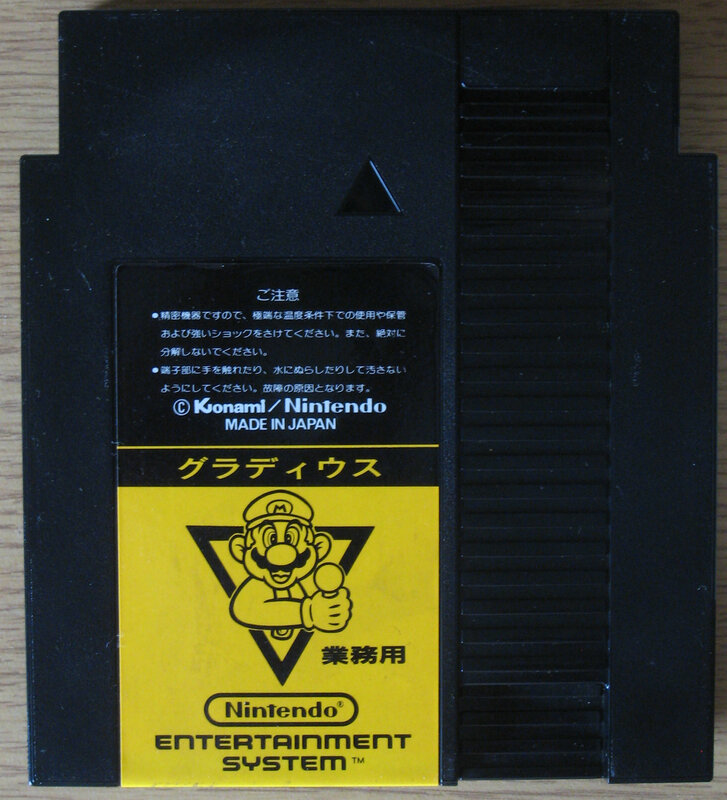 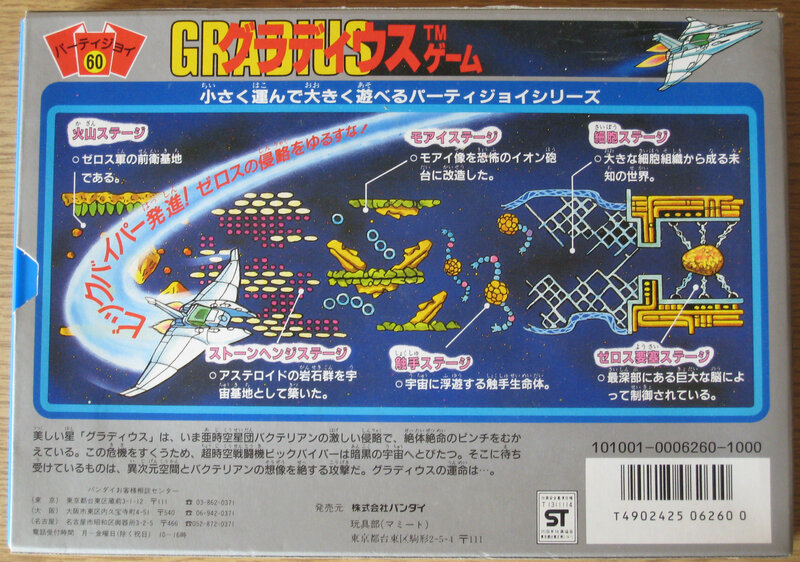 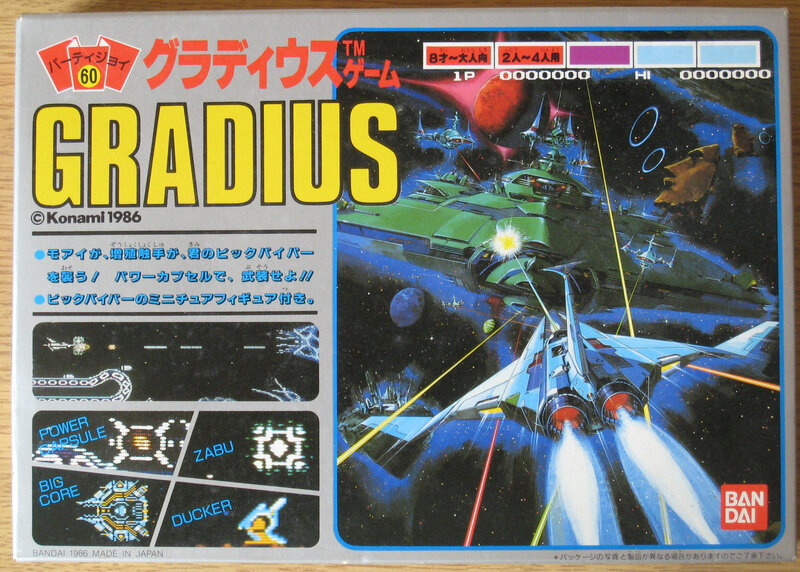 This is a version of Gradius that was in the Nintendo FamicomBox, which is a large device that can hold 15 games for use is hotels in Japan on a pay for play basis. 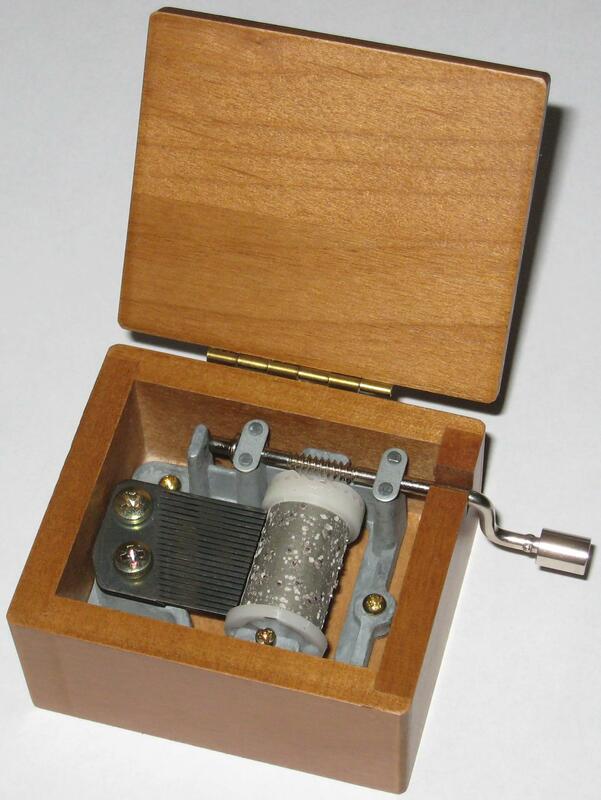 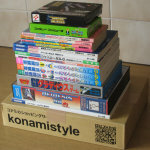 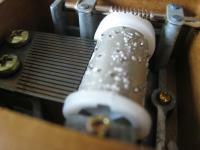 Here's a good site with lots of details about this system - http://famicomworld.com/system/other/famicombox/. 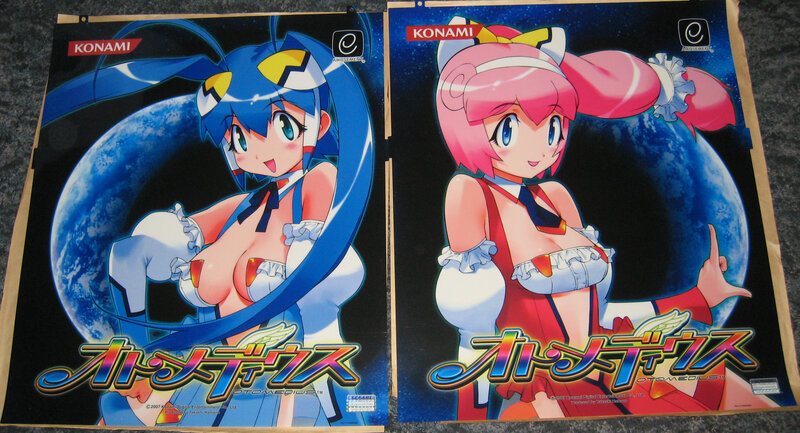 These are so nice, very glossy and can be back lit. 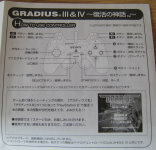 This one came with Operator's Manual, Control Panel Instruction Sheet, Pair Instruction Cards and two Joystick Stickers. 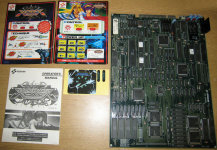 One problem was as the board had no PCB legs it sits on two capacitors when place down, one of these had a leg ripped out, so I replace both of them, installed PCB legs and the boards works good, I love that music. 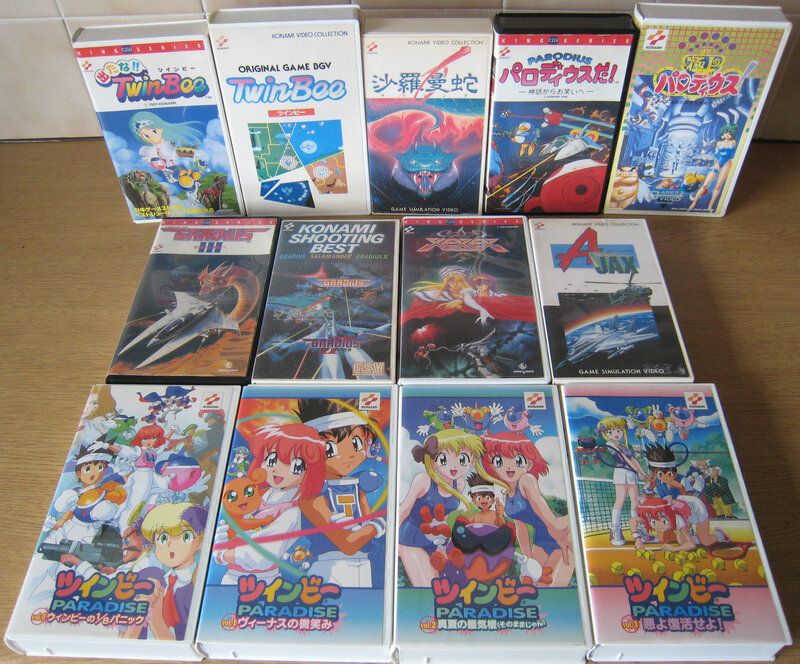 Lots of King Records Game Simulation Videos on VHS, TwinBee Paradise VHS. 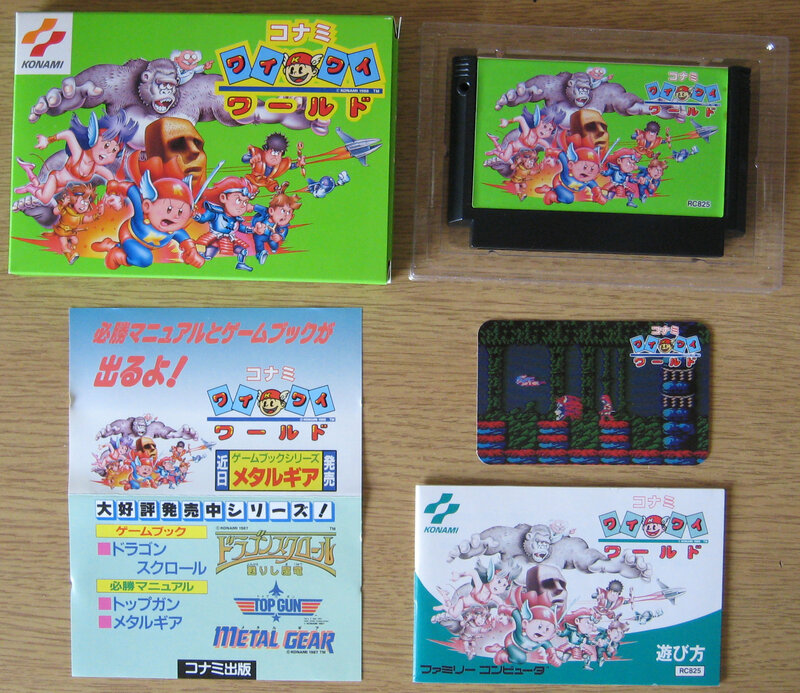 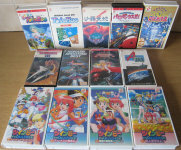 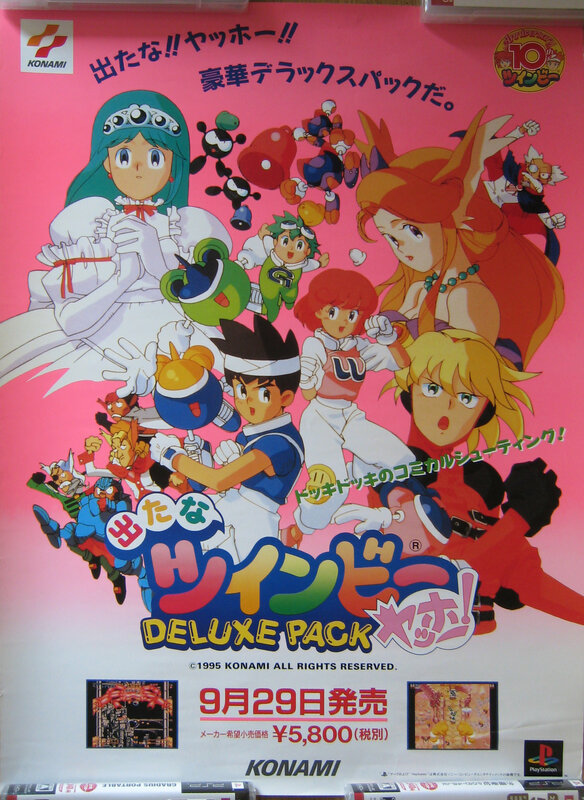 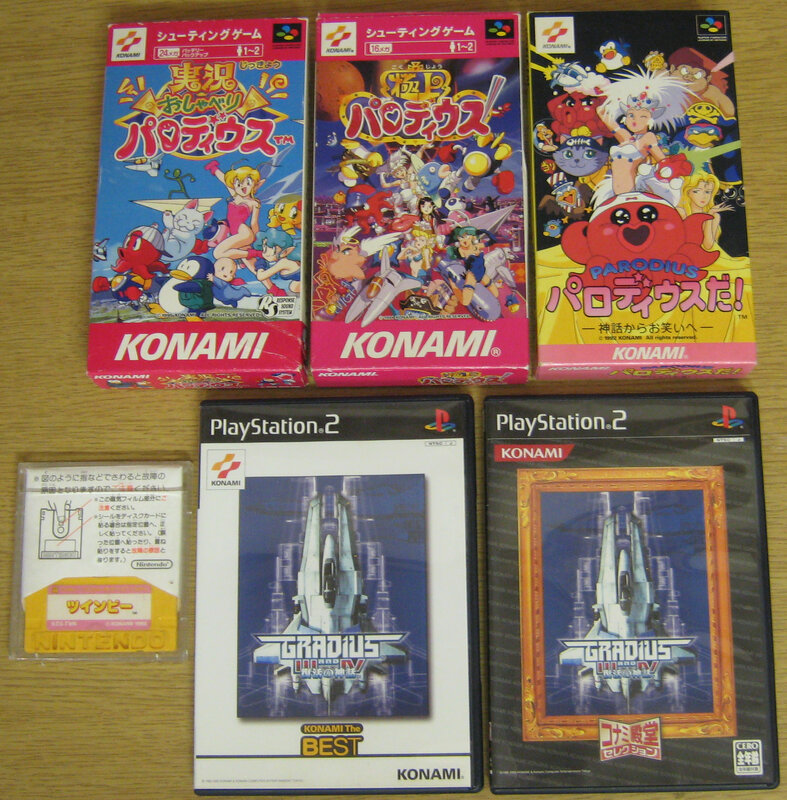 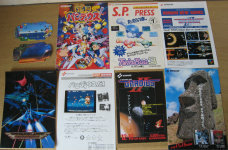 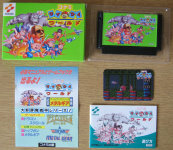 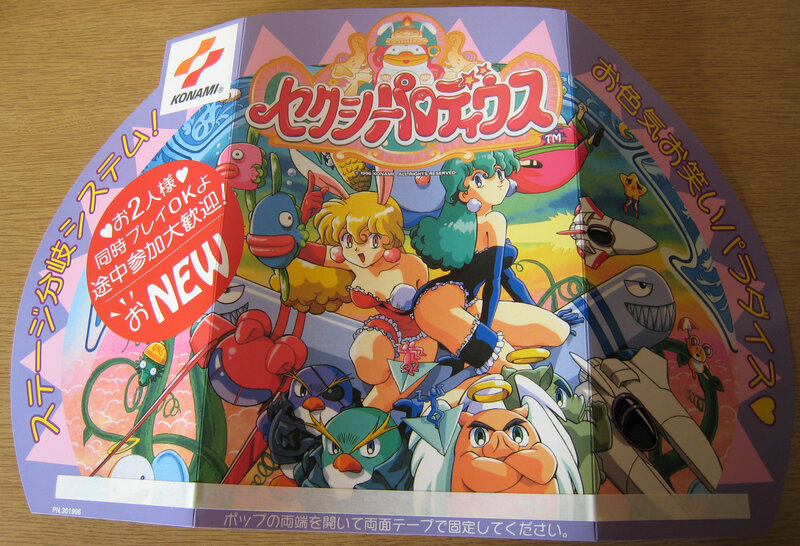 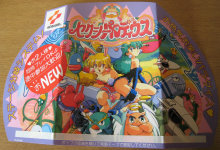 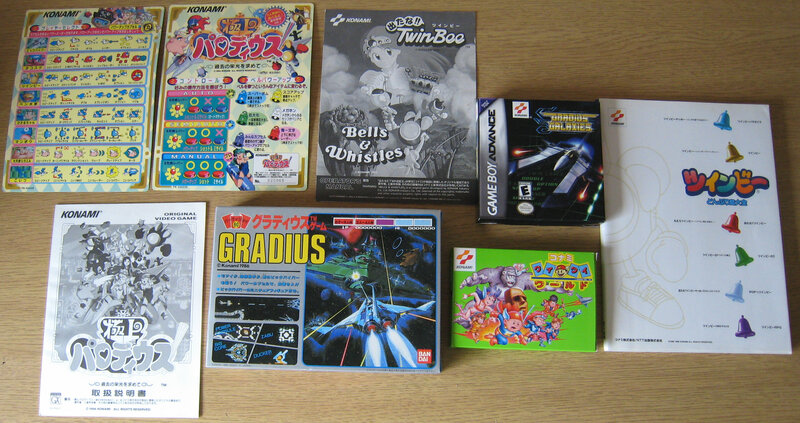 Game flyers for Gokujou Parodius Arcade, TwinBee 3 Famicom, Gradius II Super Famicom, Parodius da! 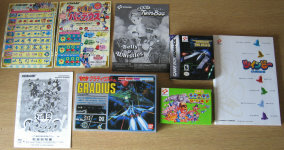 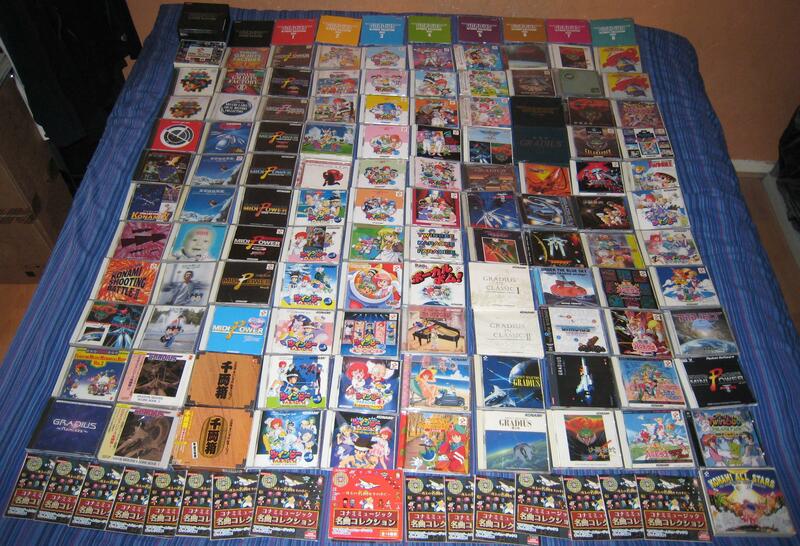 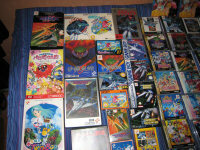 Arcade, Gradius II Famicom, Gradius and Salamander PC Engine, Salamander Collection and TwinBee Collection PSP stickers. 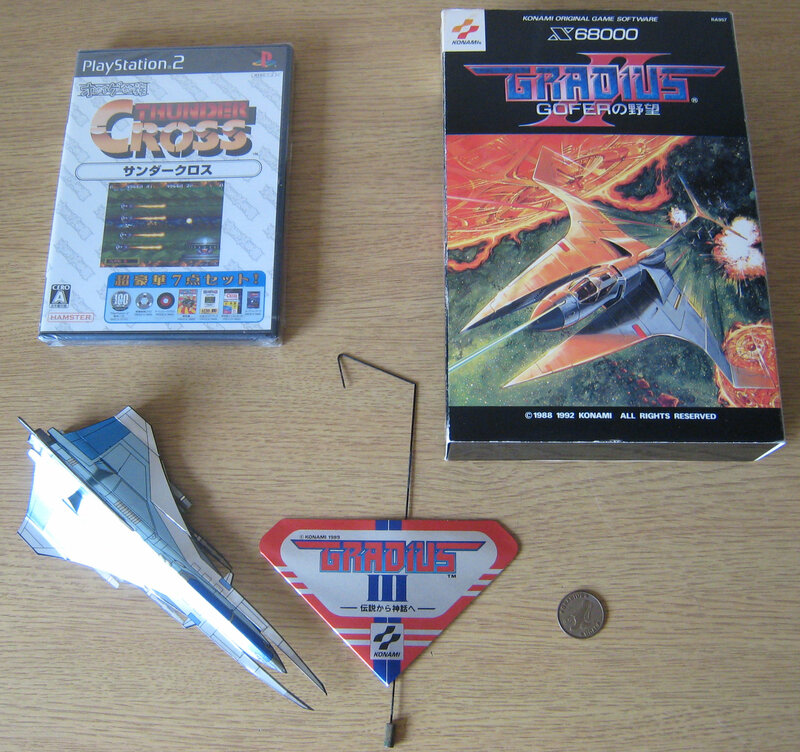 Thunder Cross PlayStation 2, another Gradius II GOFER no Yabou (great price so I could not resist), Arcade Gradius III Vic Viper and a Konami Gradius Moai Coin. 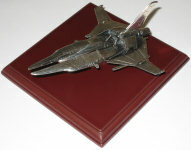 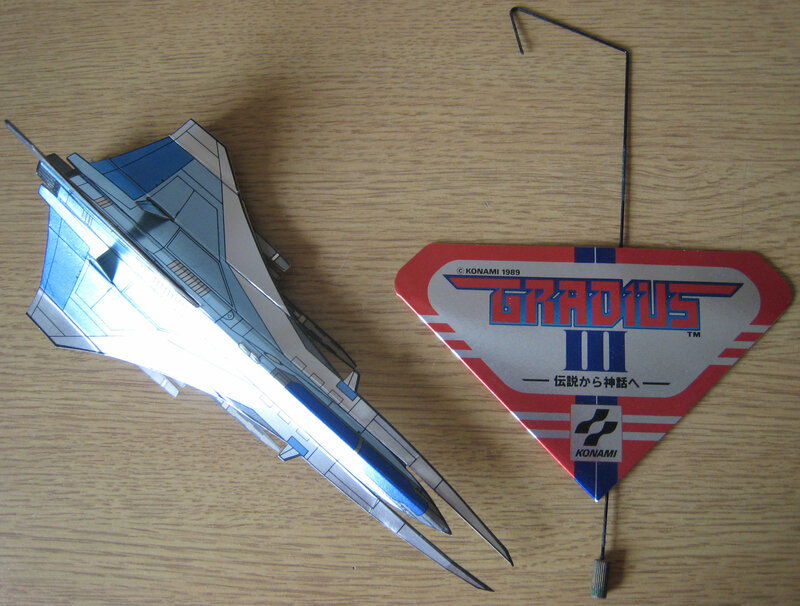 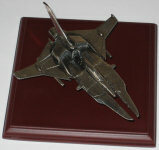 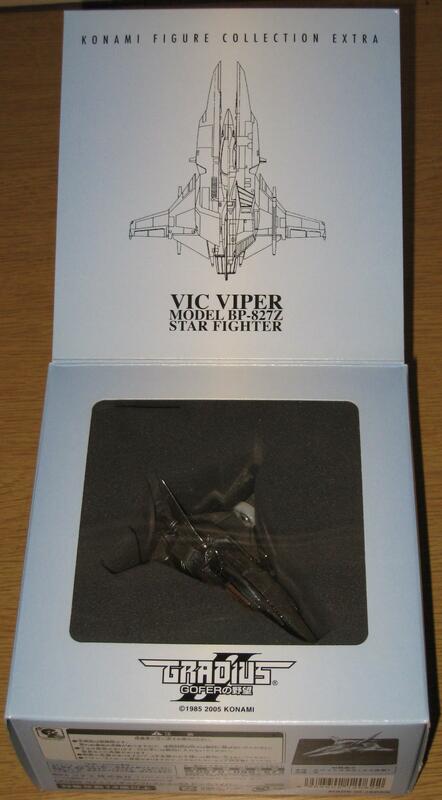 Another item to make my Gradius III arcade kit more complete. 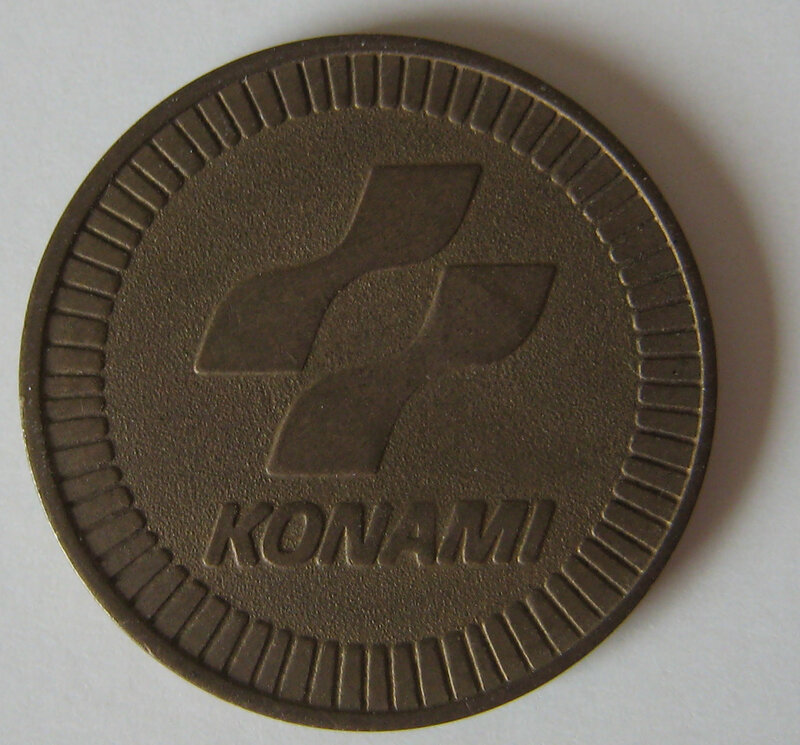 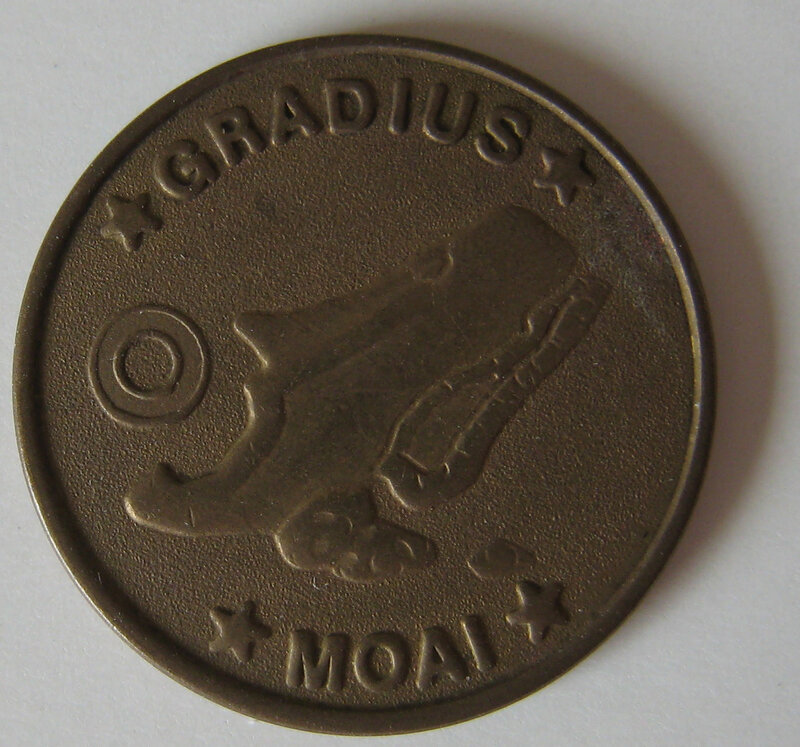 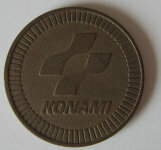 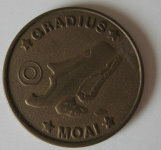 Small coin with Gradius Moai and the front and Konami logo on the back. 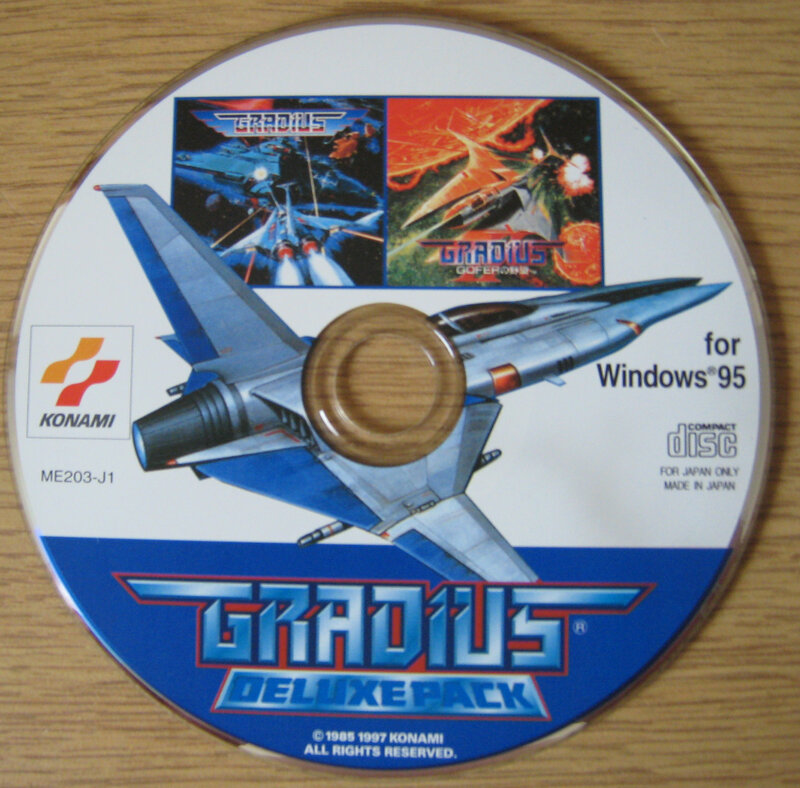 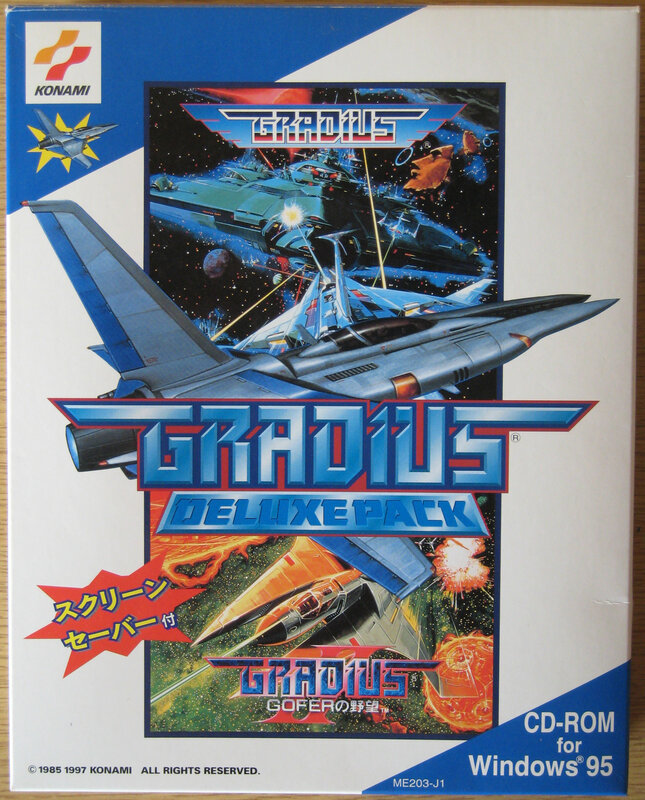 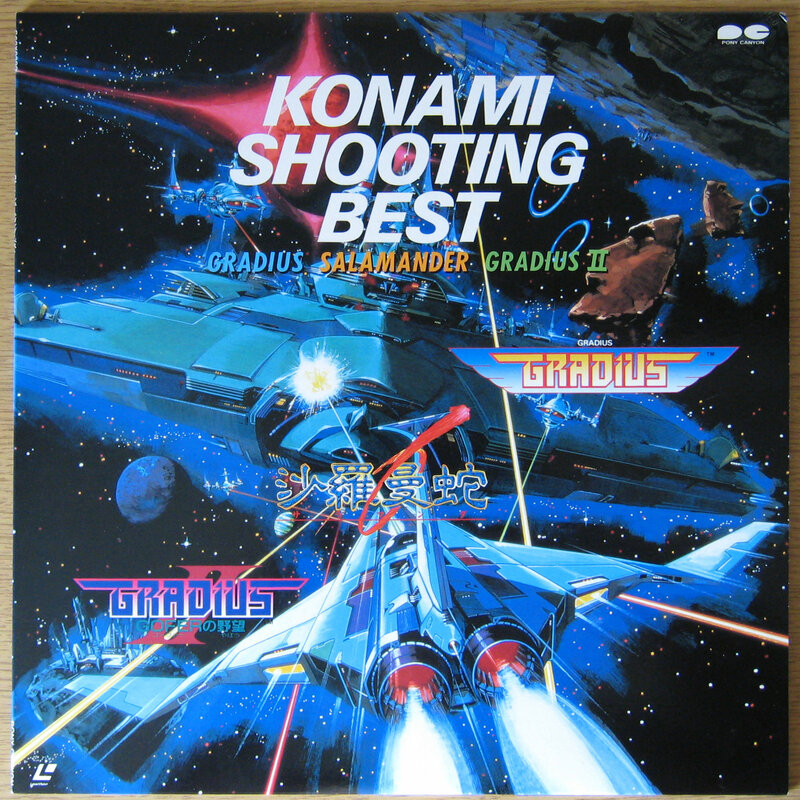 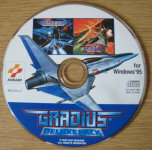 I already have this disc, in fact it's the first Gradius related CD I bought but this one had two small posters with it, not sure if they are just bundled or came with it originally. 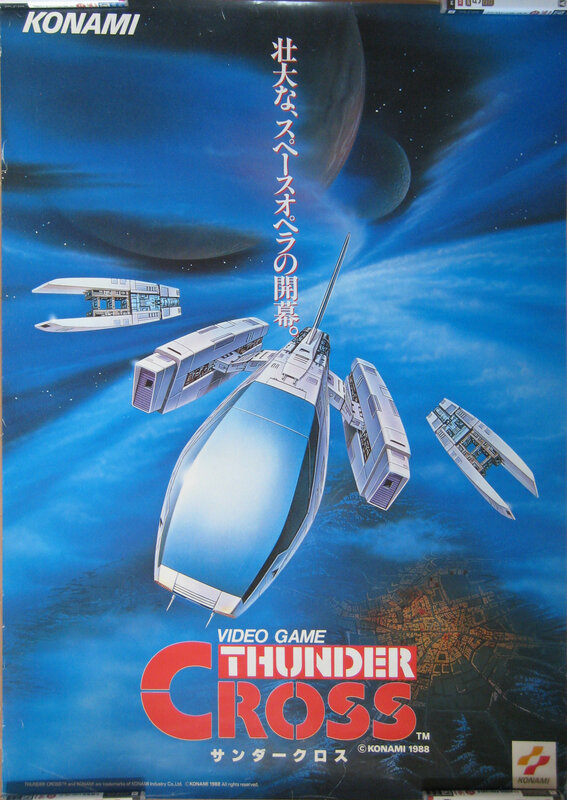 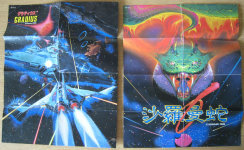 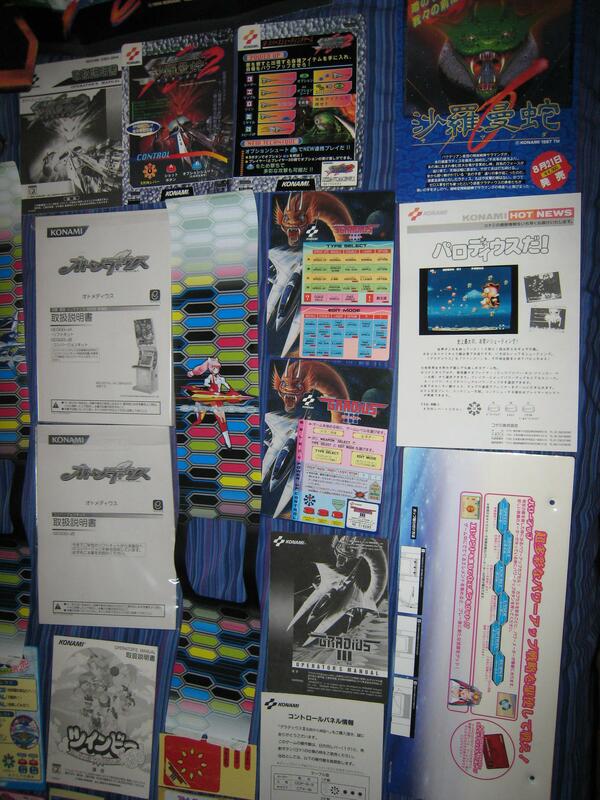 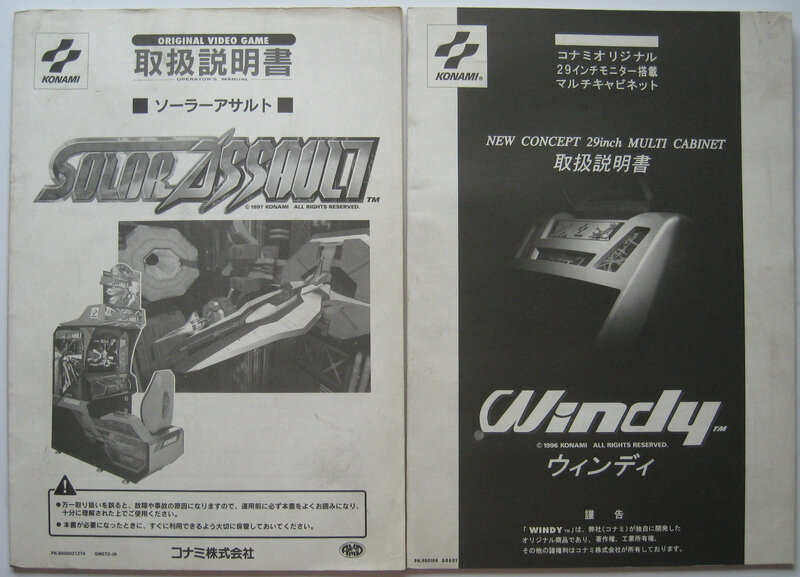 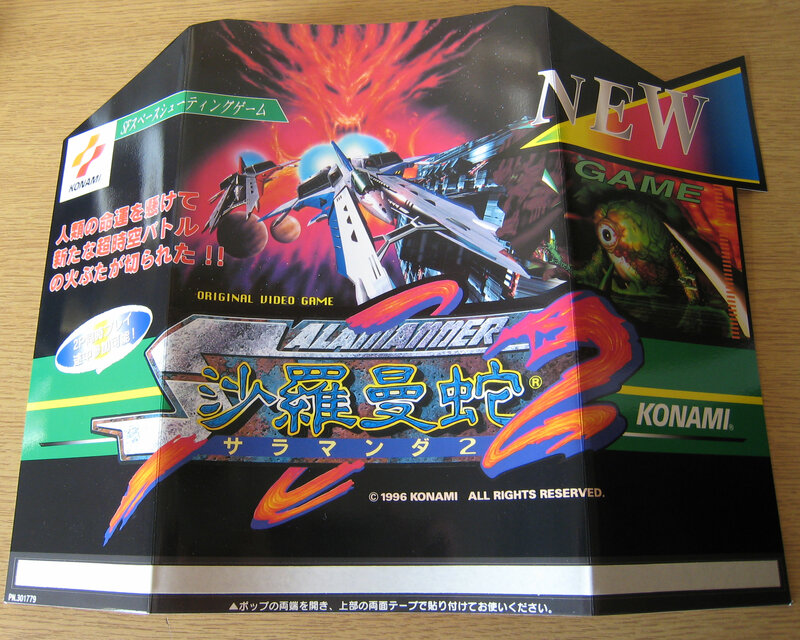 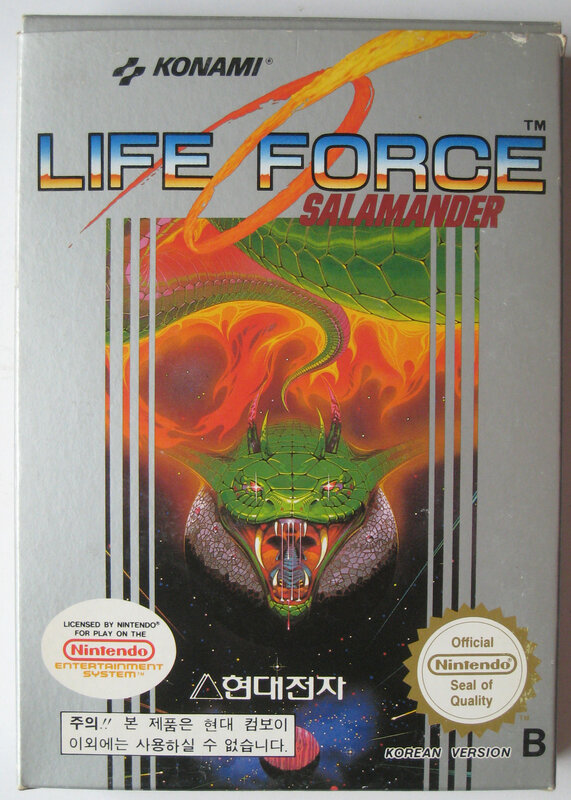 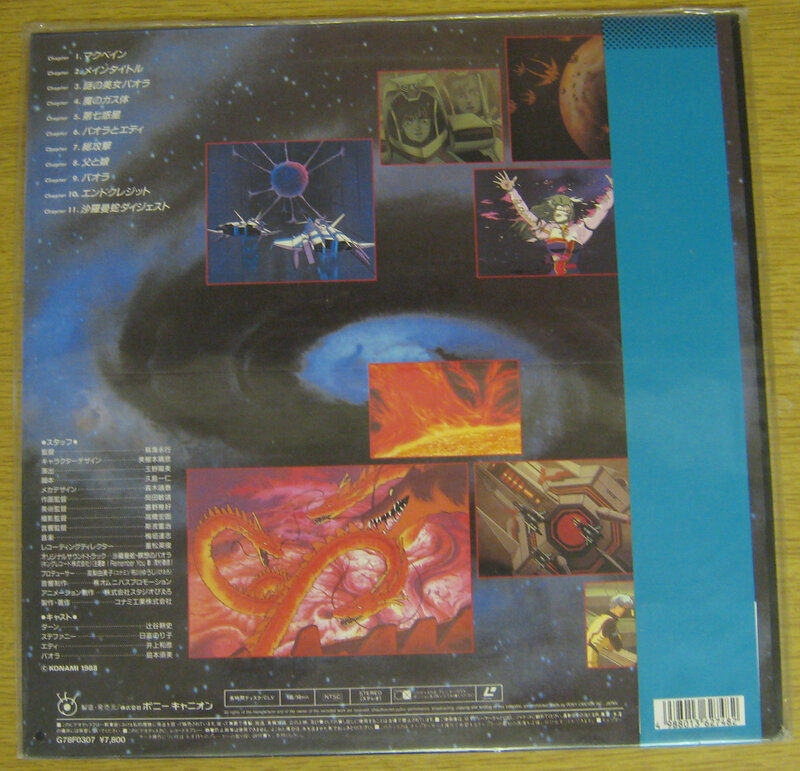 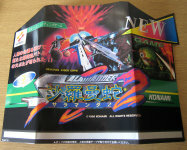 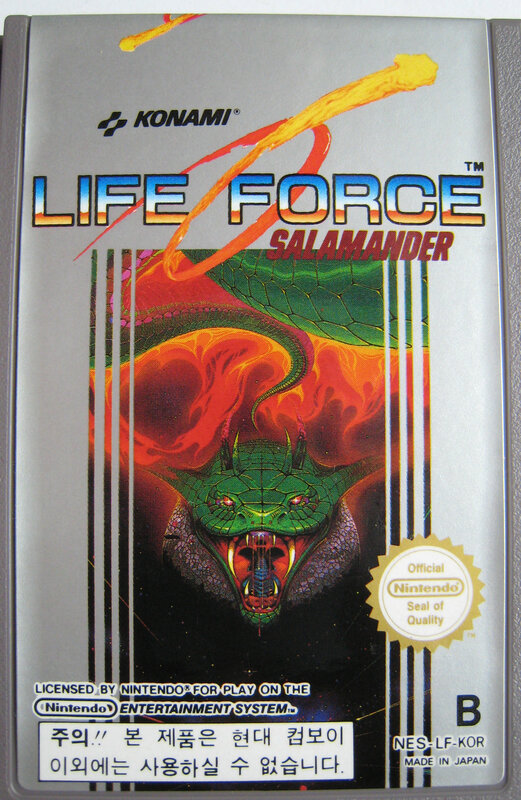 It would seam the posters have KHY-1010 and KHY-1012 posted in the bottom corners, after some research they come from Original Sound of Gradius (Famicom Version) 21-05-1986 - KHY-1010 - ¥1000 and Original Sound of Salamander (Arcade Version) 16-12-1986 - KHY-1012 - ¥1000. 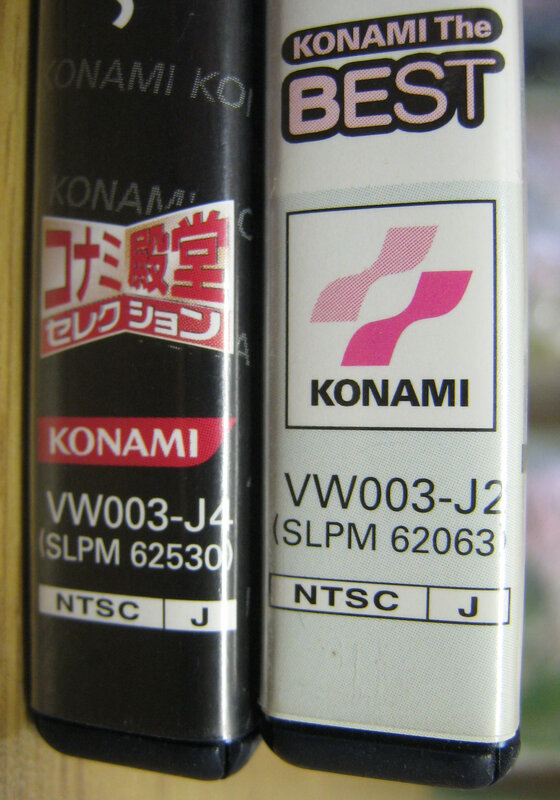 Both cassette version, that's not to say that Konami bundled these posters with this CD but I would say it's unlikely, well mystery solved, they are nice little posters anyway. 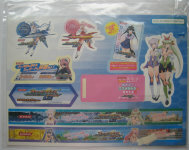 I already had some of the items but was missing the joystick stickers and supplement sheet. 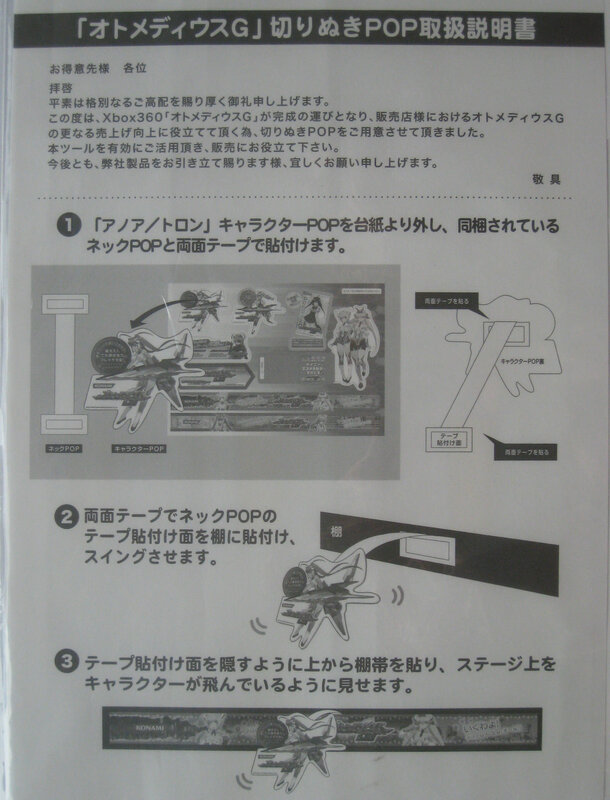 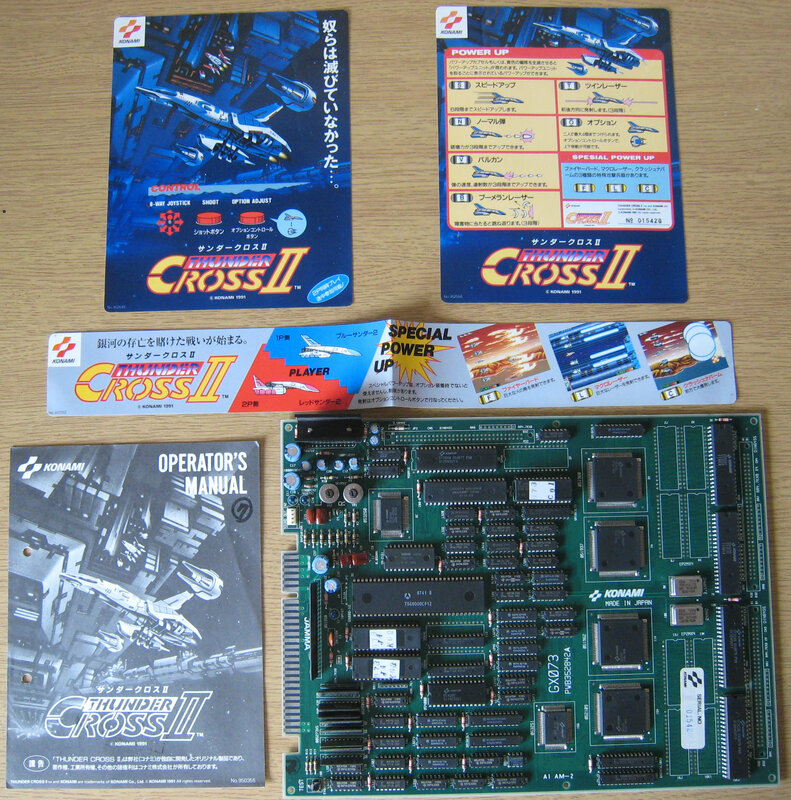 Operator's Manual, Pair Instruction Cards, Joystick Sticker, Supplement Sheet. 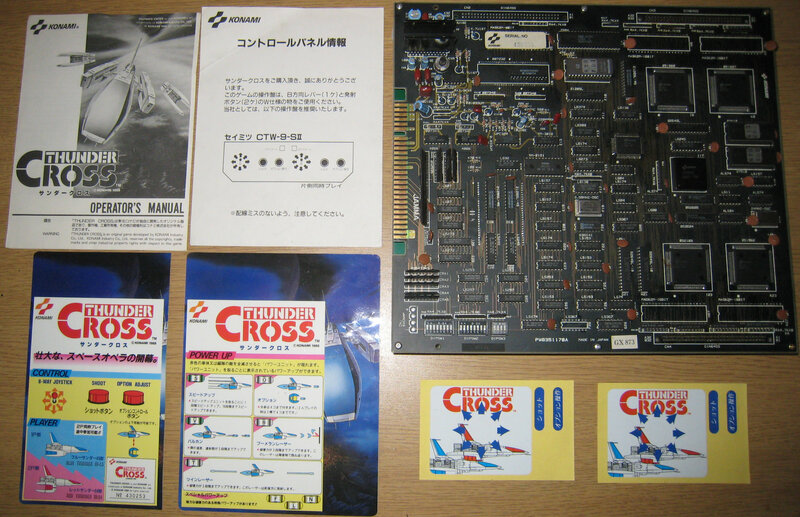 I've wanted this for a long time, this one came with Operator's Manual, Pair Instruction Cards and Banner Sticker. Apart from the Operator Instructions have been hole punched and written on, the Serials on the Instruction Cards match the board. Otomedius X (Excellent!) 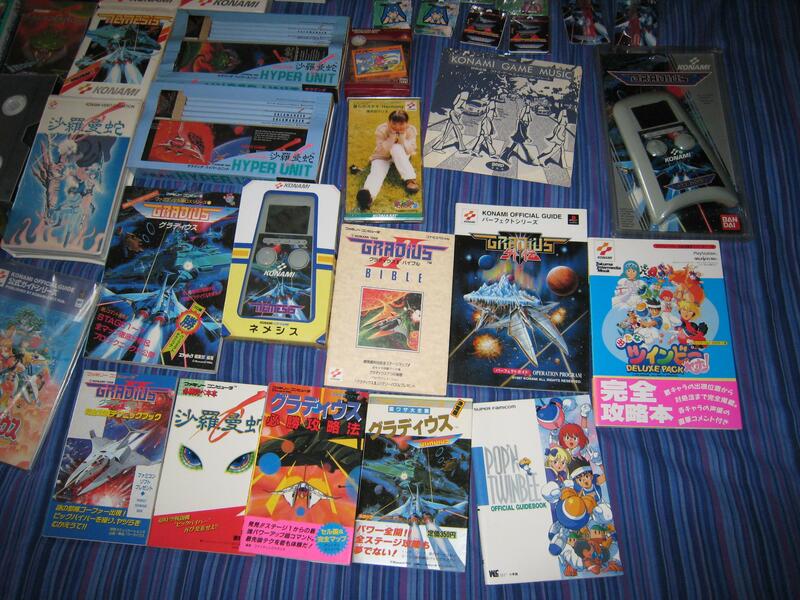 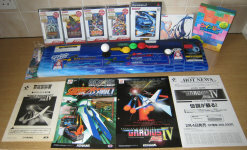 Original Soundtrack and two badges, Otomedius Arcade control panel, Gradius IV ~Fukkatsu~ Original Operators Manual, Solar Assault, Gradius IV ~Fukkatsu~ arcade flyers, TwinBee Paradise DVD boxset, Gradius III AND IV Fukkatsu no Shinwa, Gradius V and Gradius Generation posters. I also bought all the games that Konamistyle still sells for the PSP and PlayStation 2. 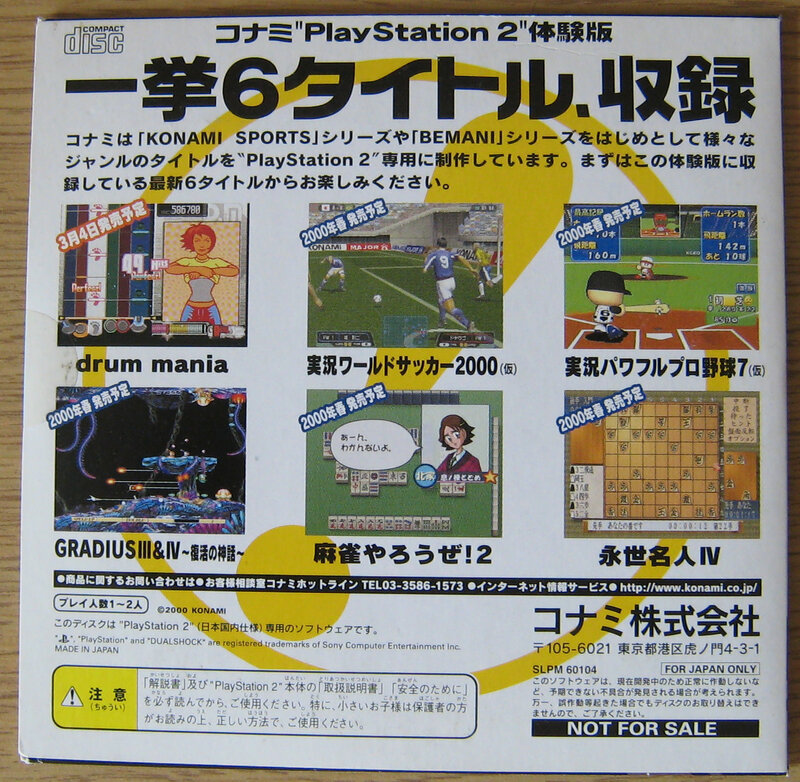 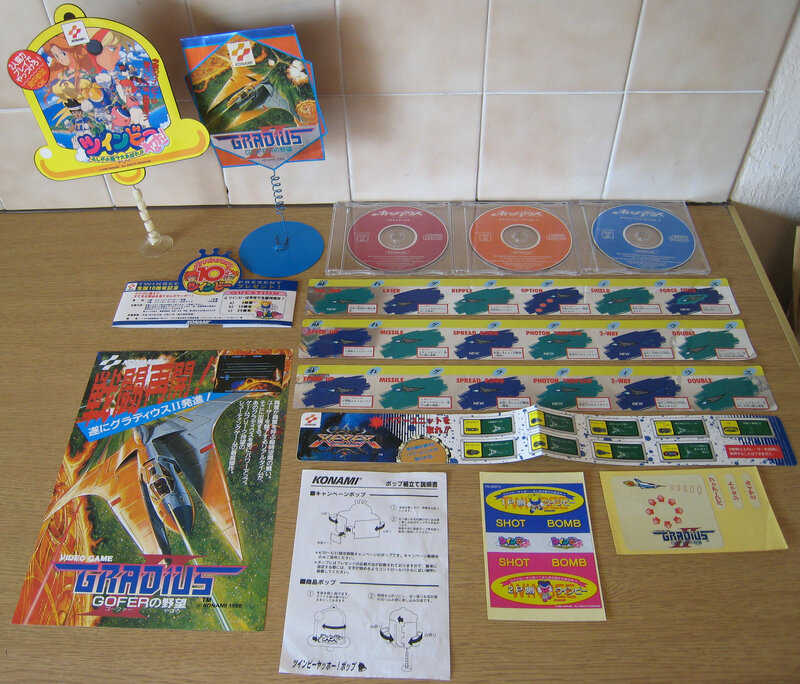 Gradius Portable (PSP), Salamander Portable (PSP), Parodius Portable (PSP), TwinBee Portable (PSP) and Gradius V (PS2). 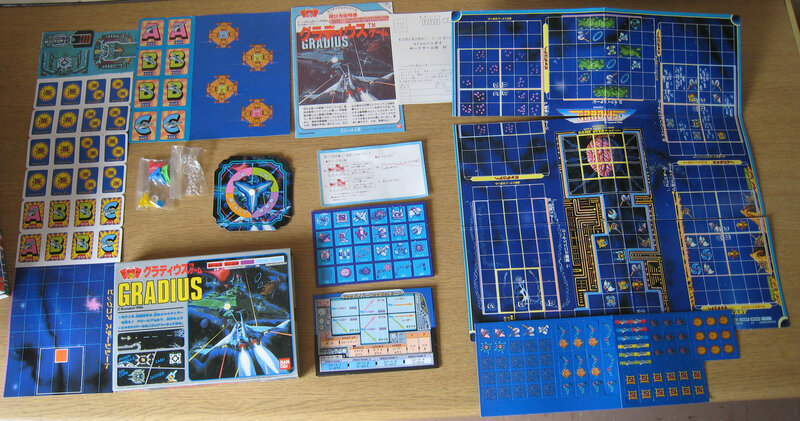 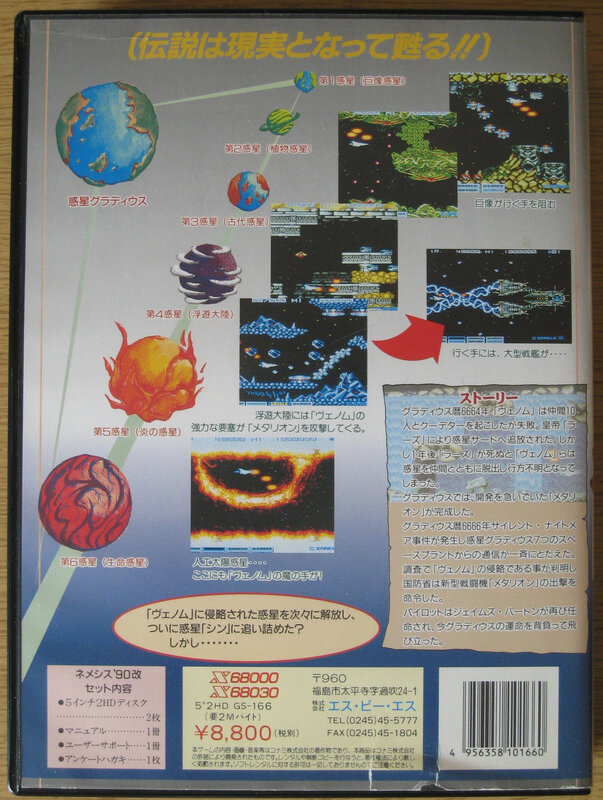 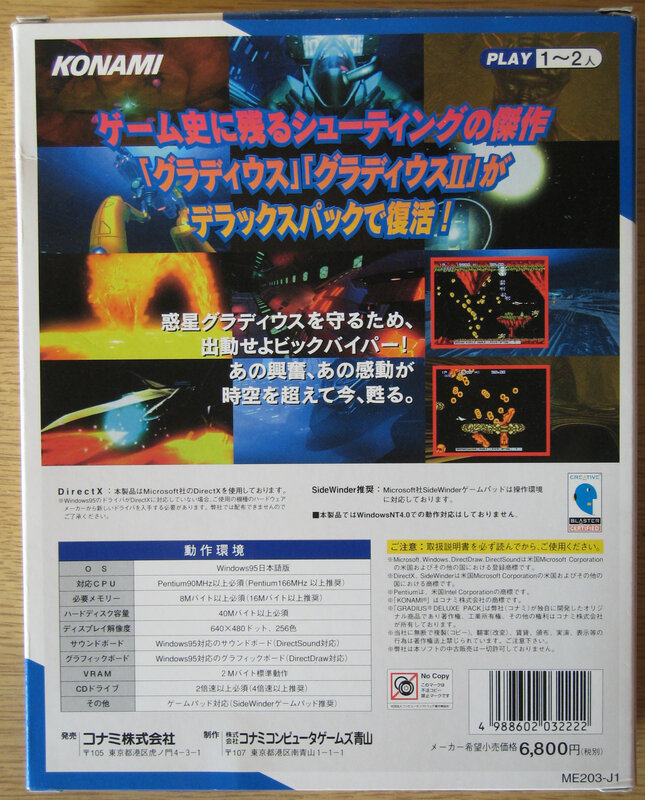 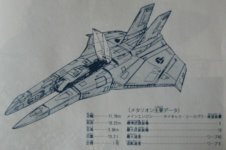 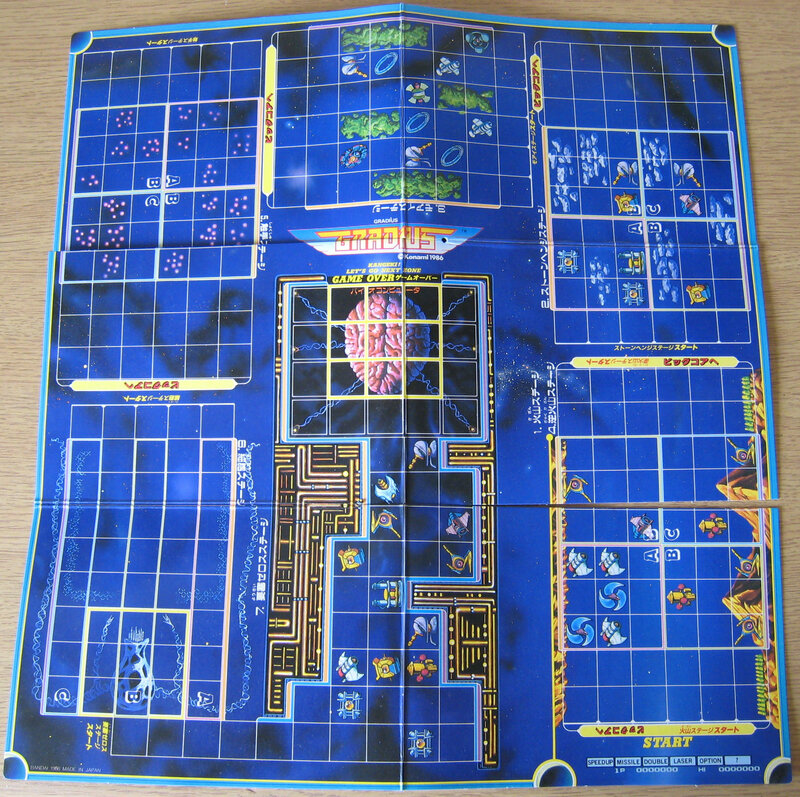 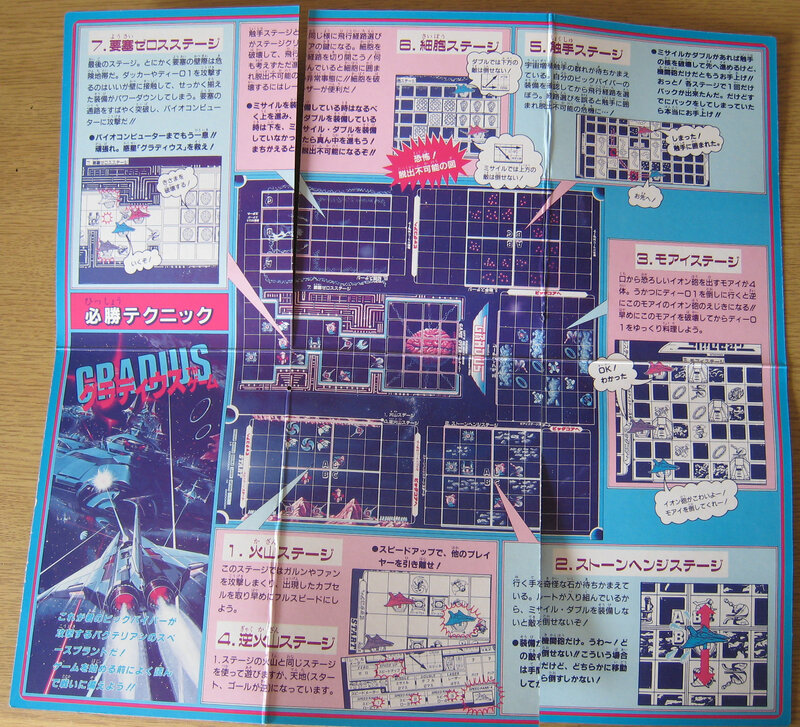 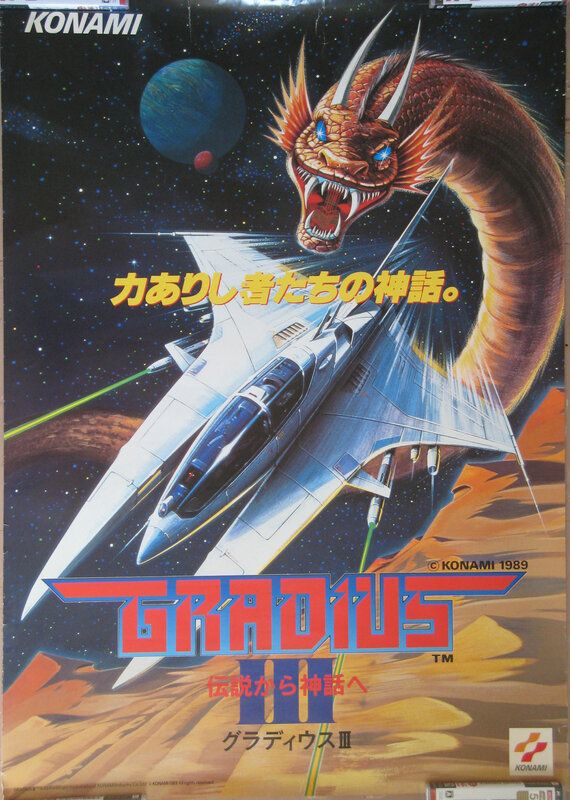 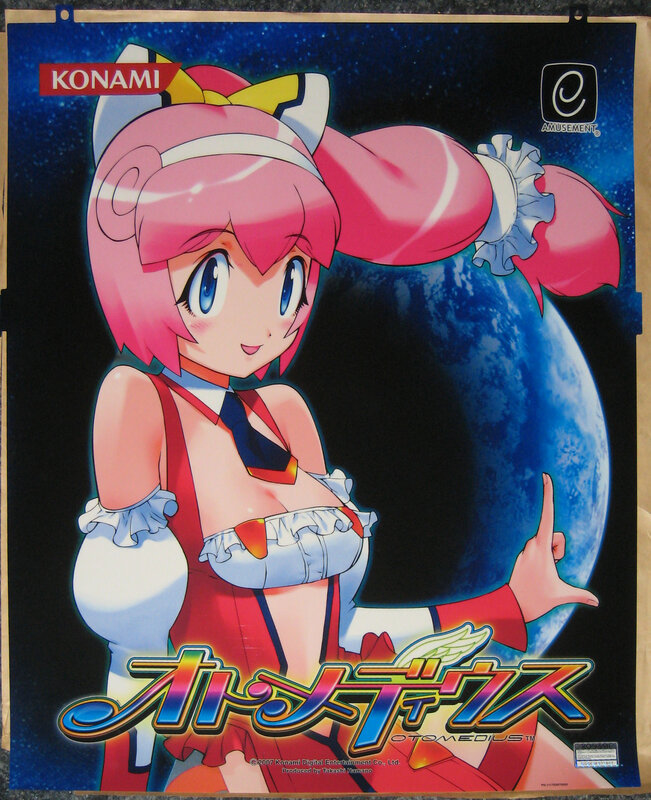 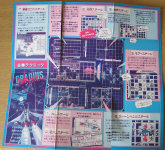 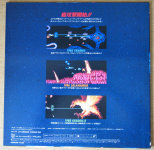 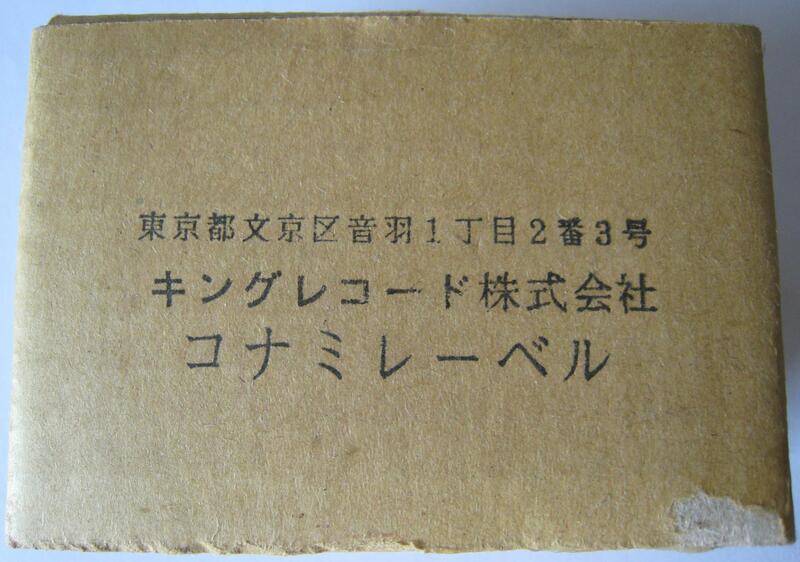 Also this is the only original Gradius IV ~Fukkatsu~ Operators Manual I have ever seen. Clearly used and a little scratched but I got it for £20 so I'm not too bothered. 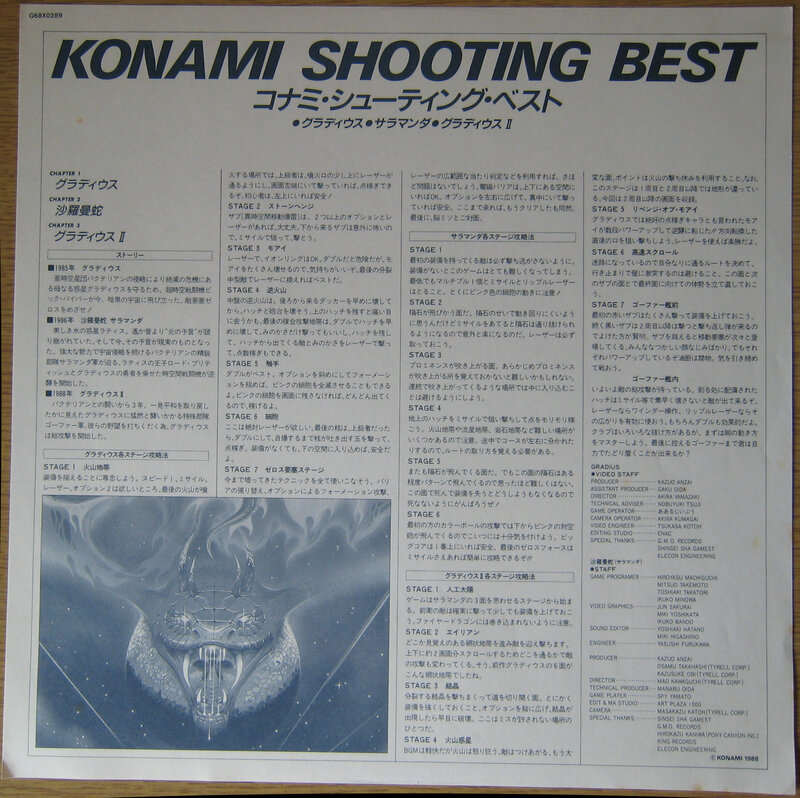 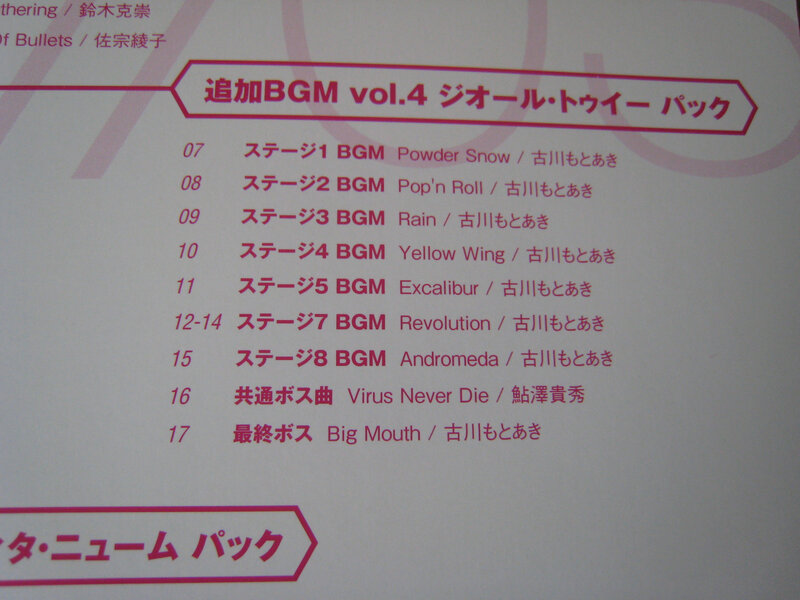 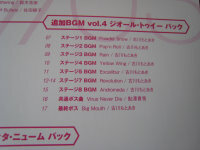 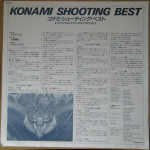 Konamistyle show a wrong track for track 16 of disc 3. The other posters I got last year but never got around to photographing them. 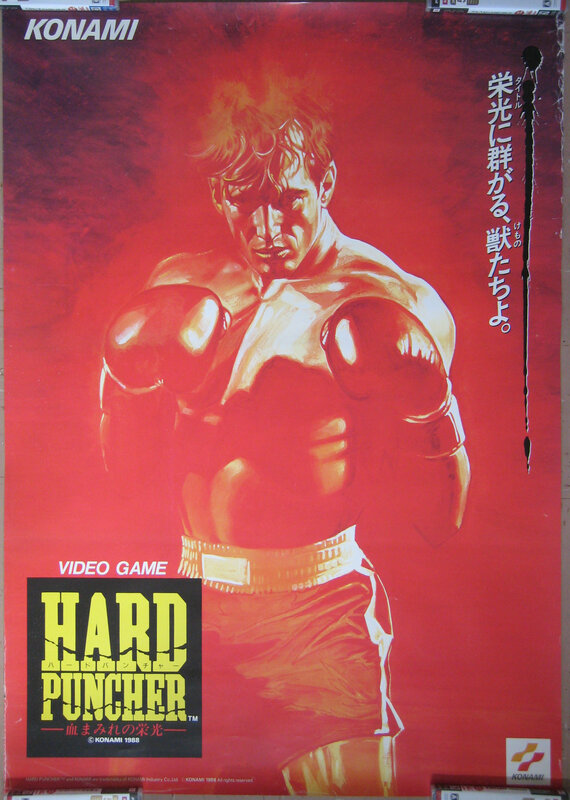 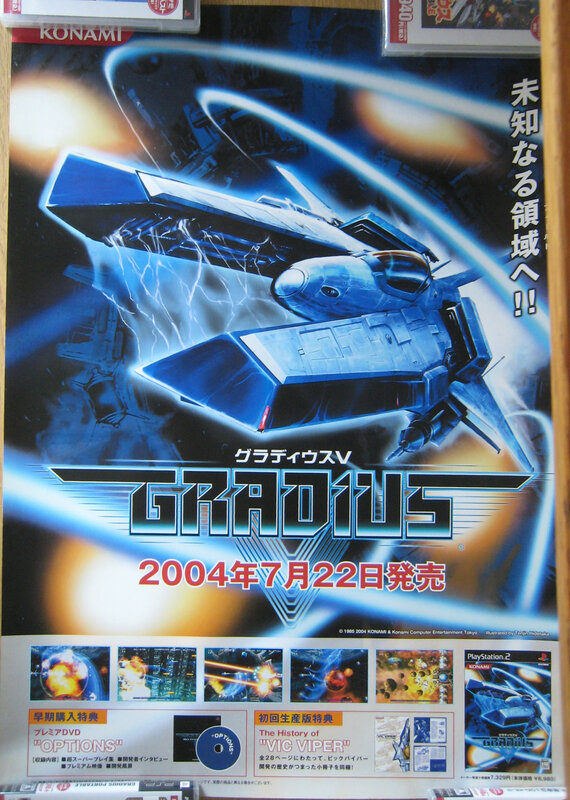 When I bought Gradius III and Thunder Cross, Hard Puncher poster was also included, not Gradius related but a nice detailed classic poster. 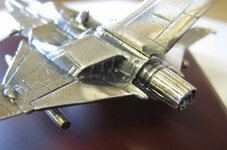 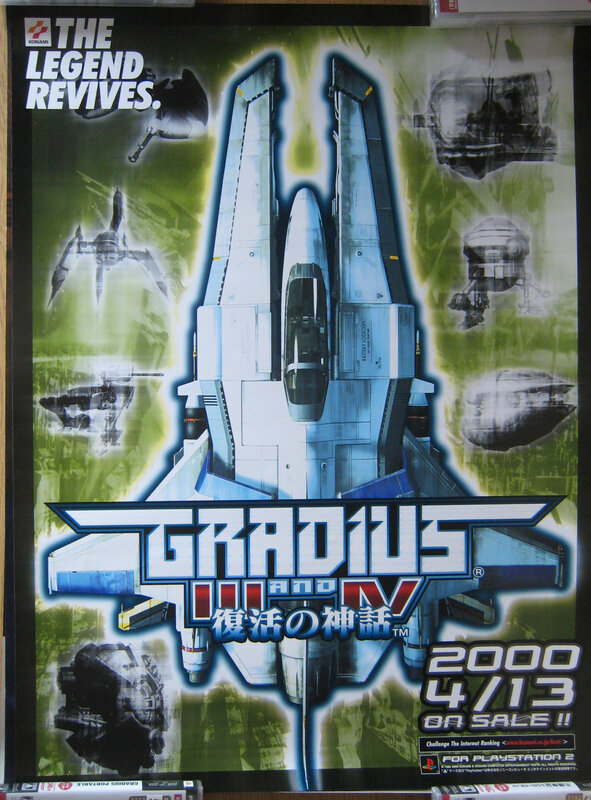 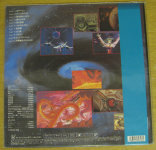 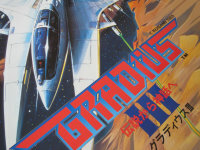 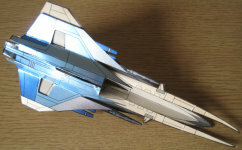 Here's a close up shot to show the detail of the Gradius III poster, now this is some great detailed hand painted work. 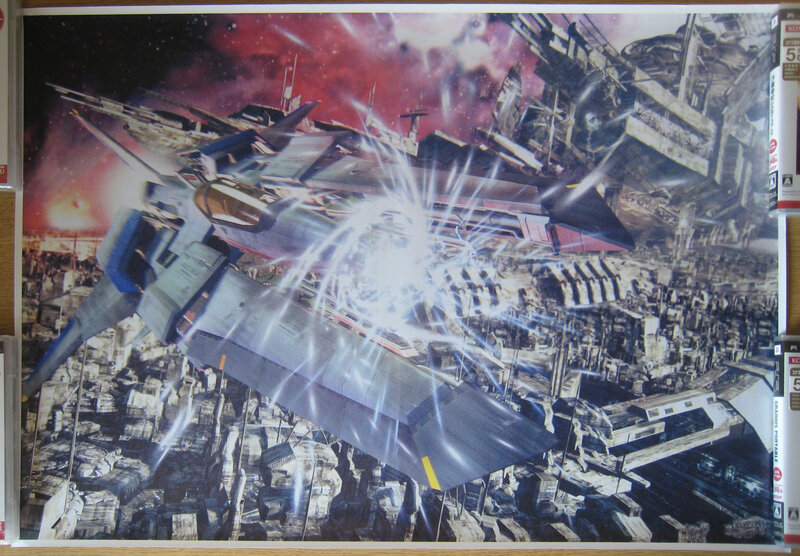 This a poster I had printed many years ago, it's quite lo-res and pretty poor. 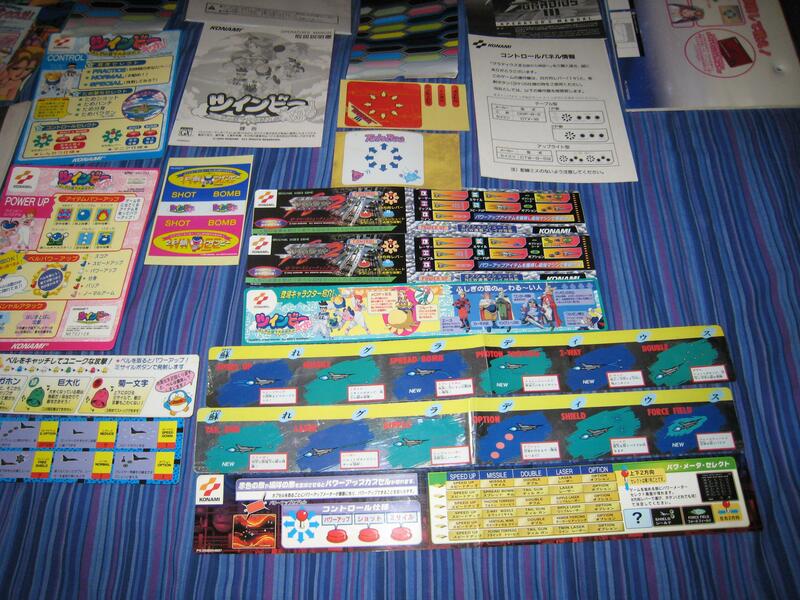 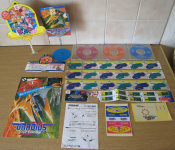 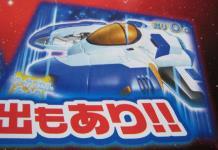 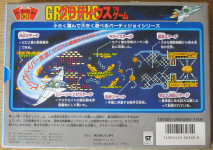 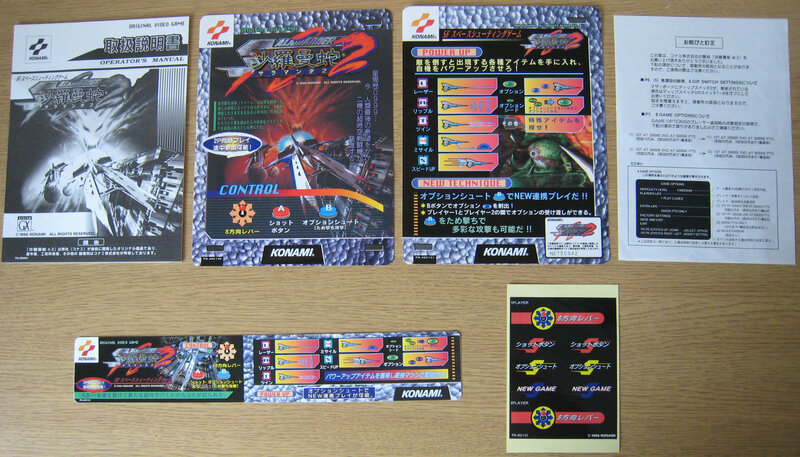 Gradius II Gofer no Yabou flyer, three Banner Weapon Stickers, Joystick Stickers and Springy Thing, also springy thing for TwinBee Yahho-! 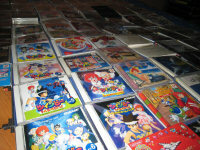 ~Fushigi no Kuni de Ooabare! 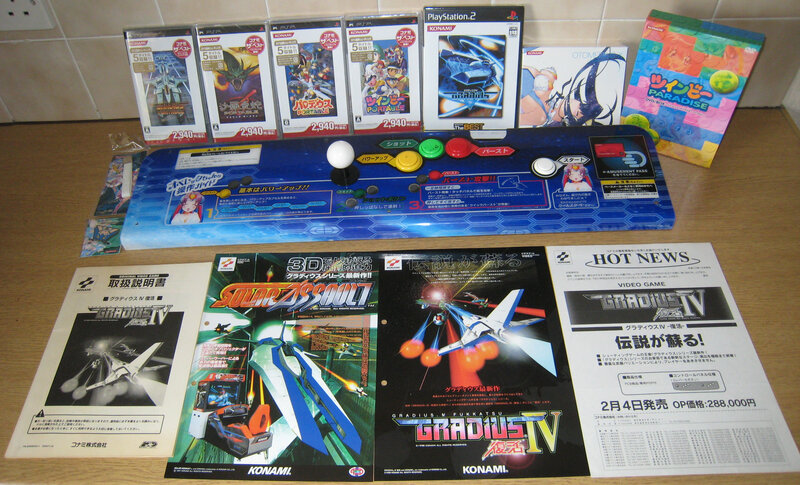 !~, Joystick Stickers, the missing Xexex Banner Sticker (plus second arcade board not shown), Otomedius arcade install CD's. 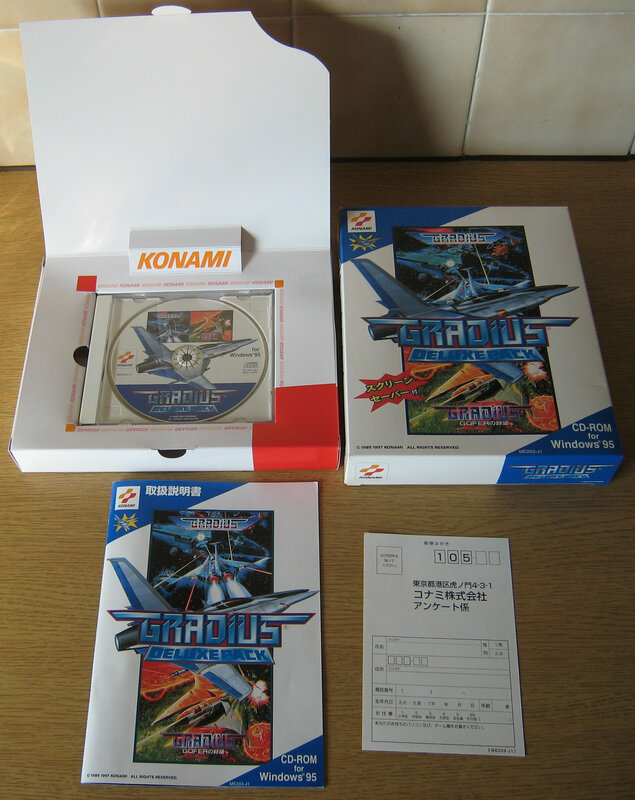 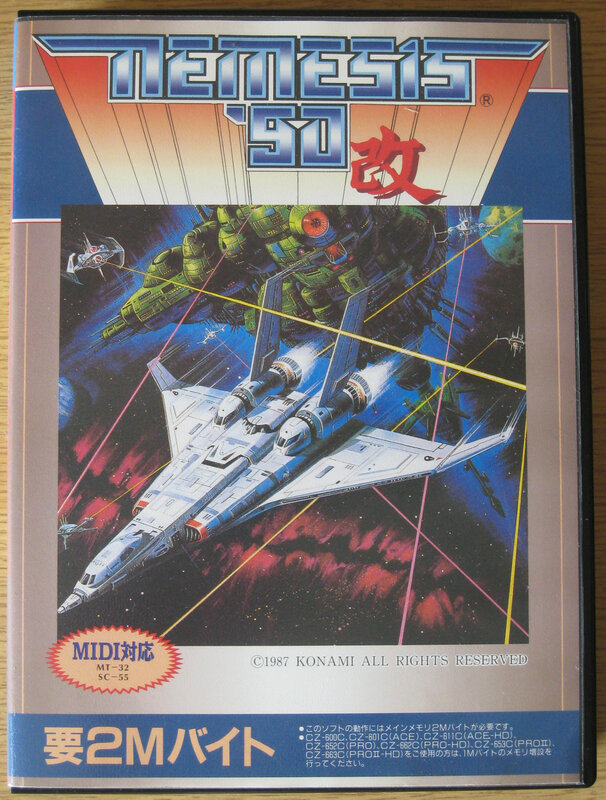 Here's something I've been looking for for years, one of the most rare Gradius games. 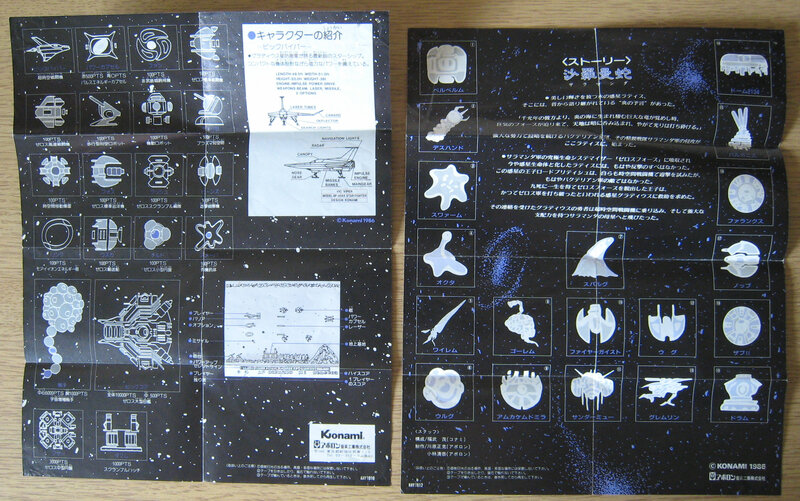 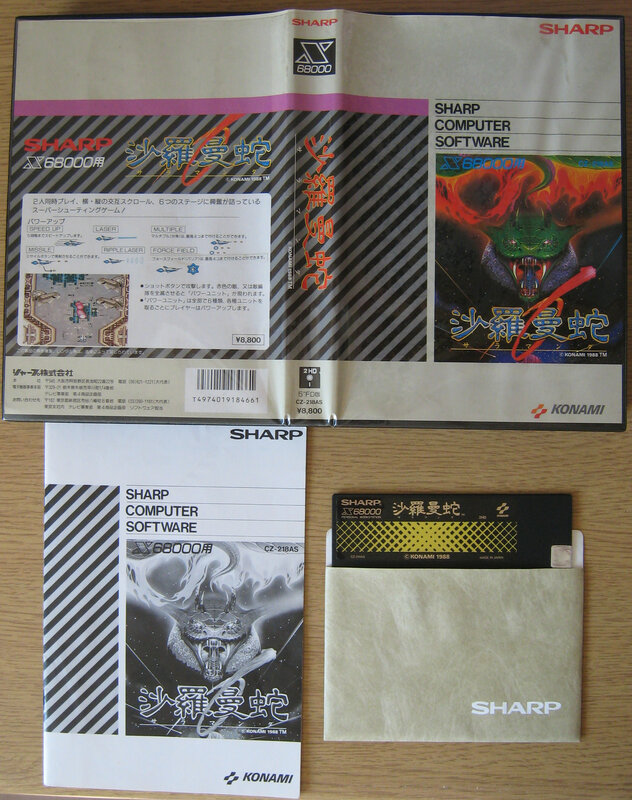 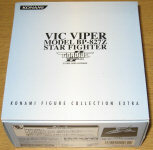 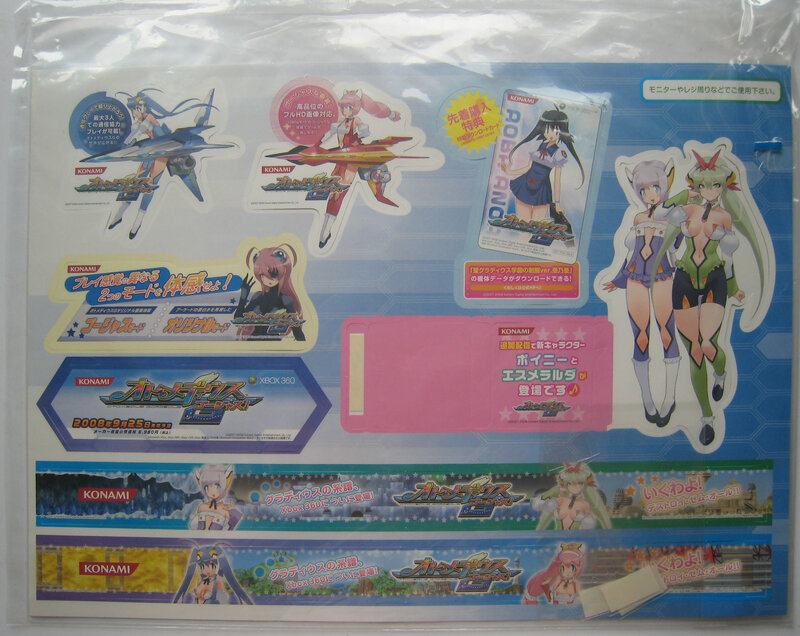 Including original Operator Manual and Instruction cards (banner sticker is a poor copy). 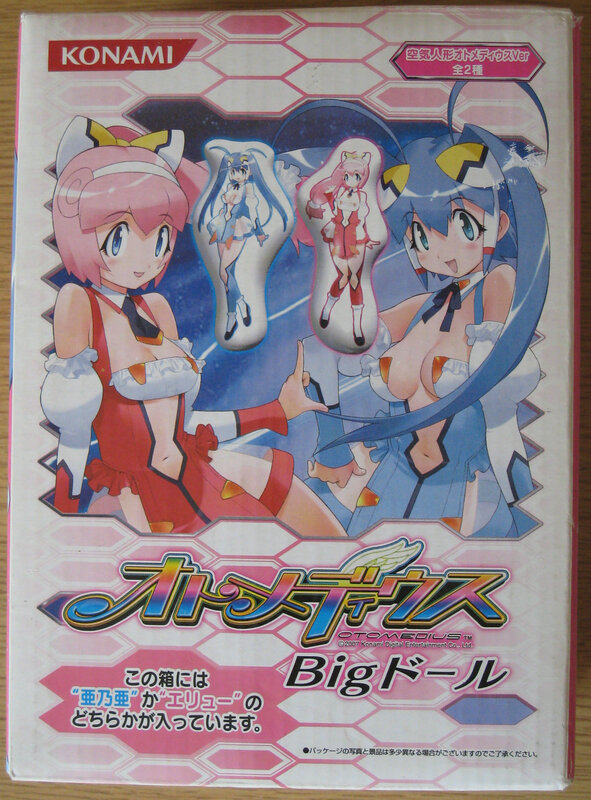 My LD player is not currently set up at the moment to actually watch this. 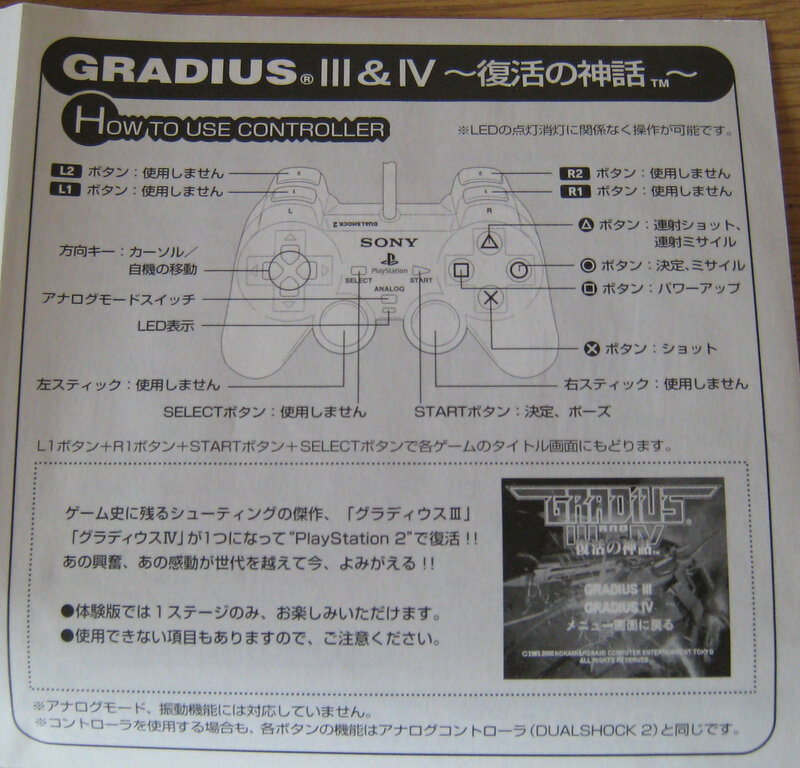 Demo versions of Gradius III stage 1 and Gradius IV stage 2, after you have completed the stage the game exits back to the title screen. 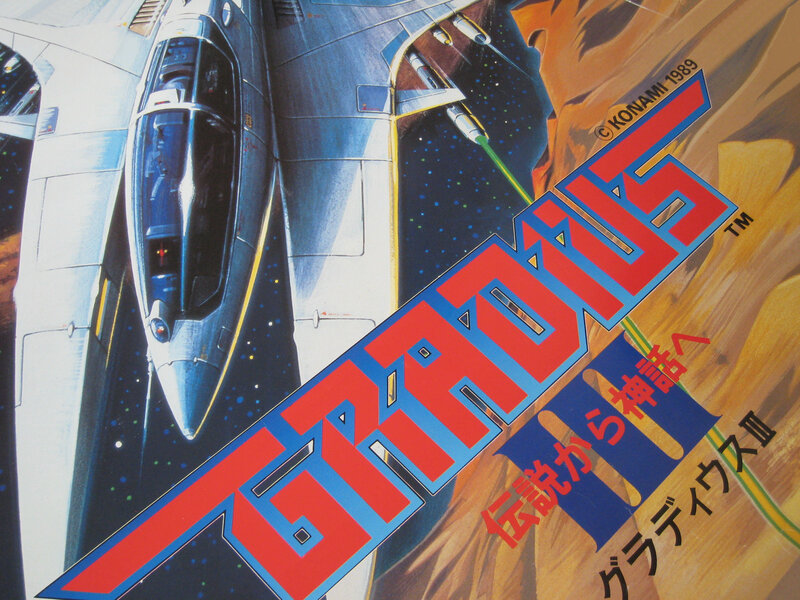 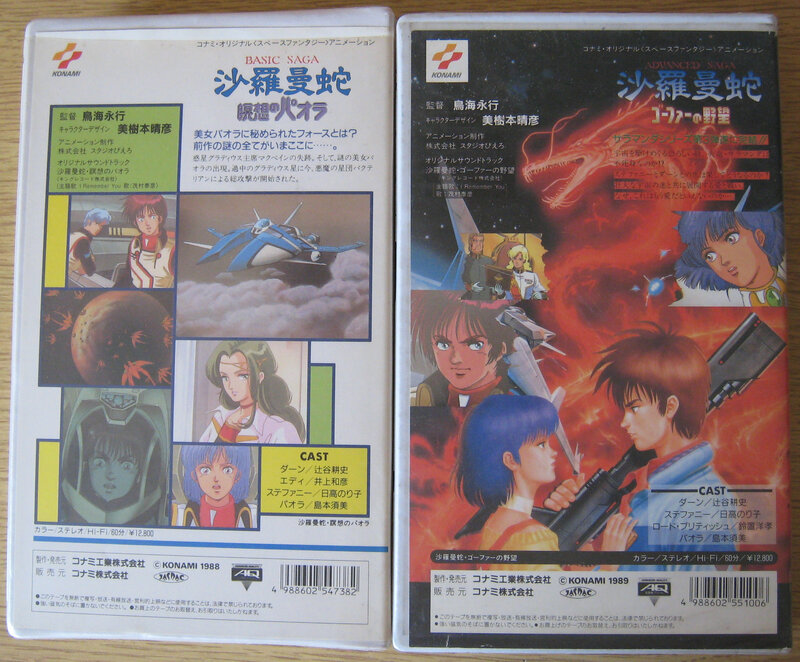 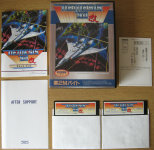 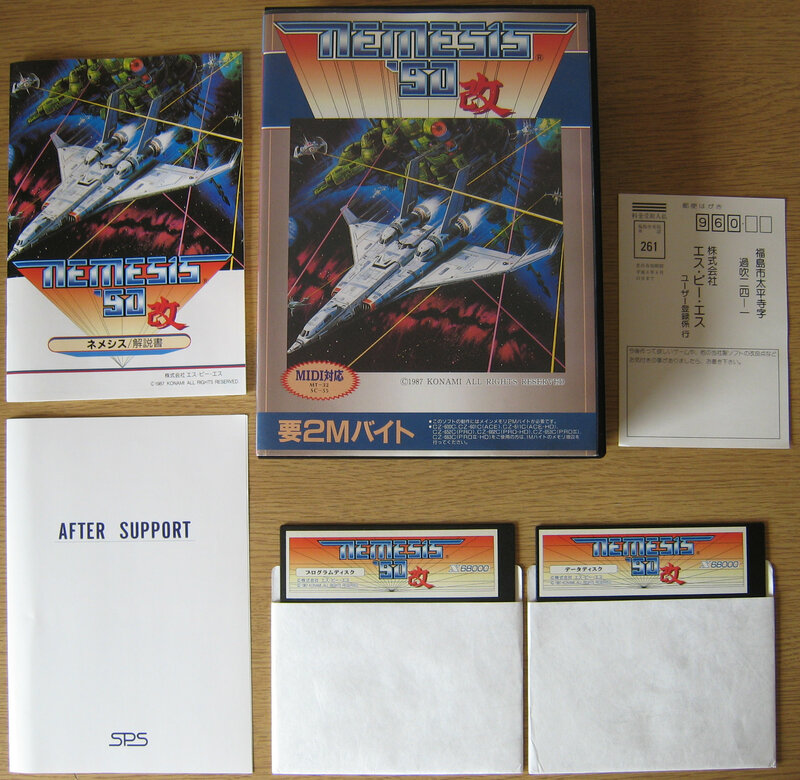 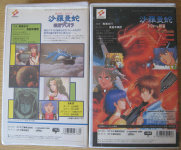 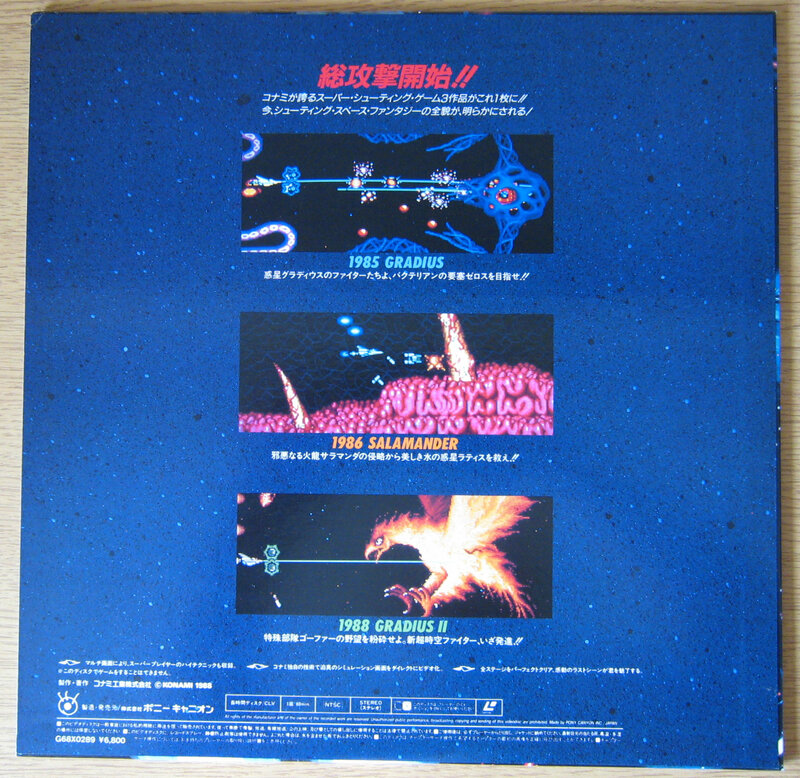 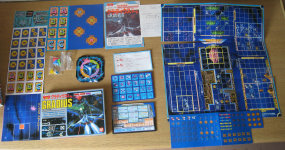 Demo versions of Gradius Stage 1 and Gradius II GOFER no Yabou Stage 1, after you have completed the stage the game exits back to the title screen. 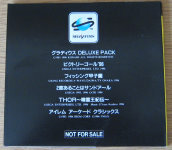 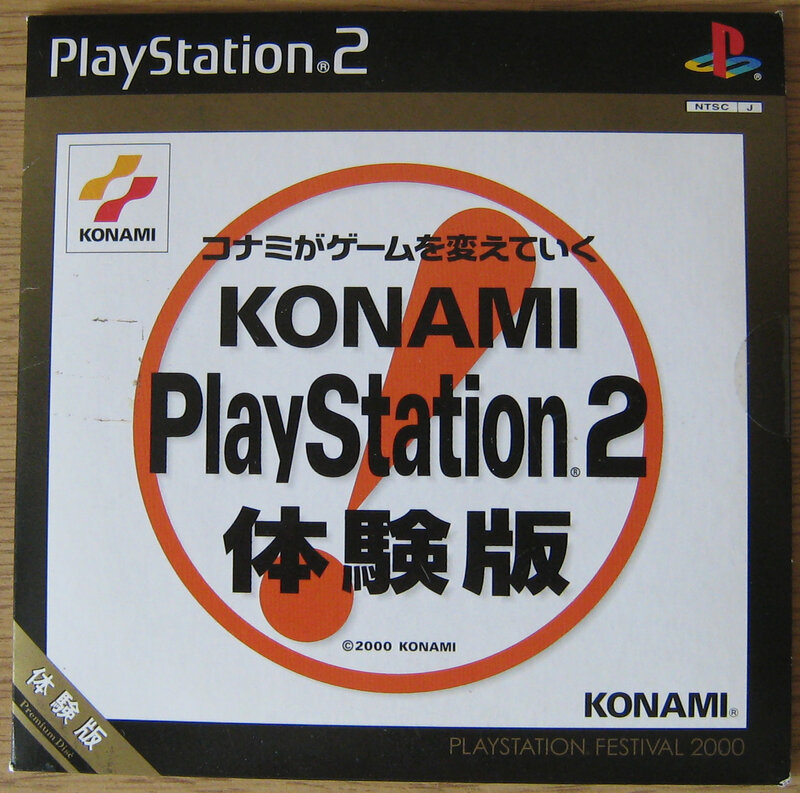 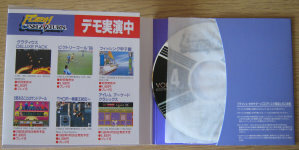 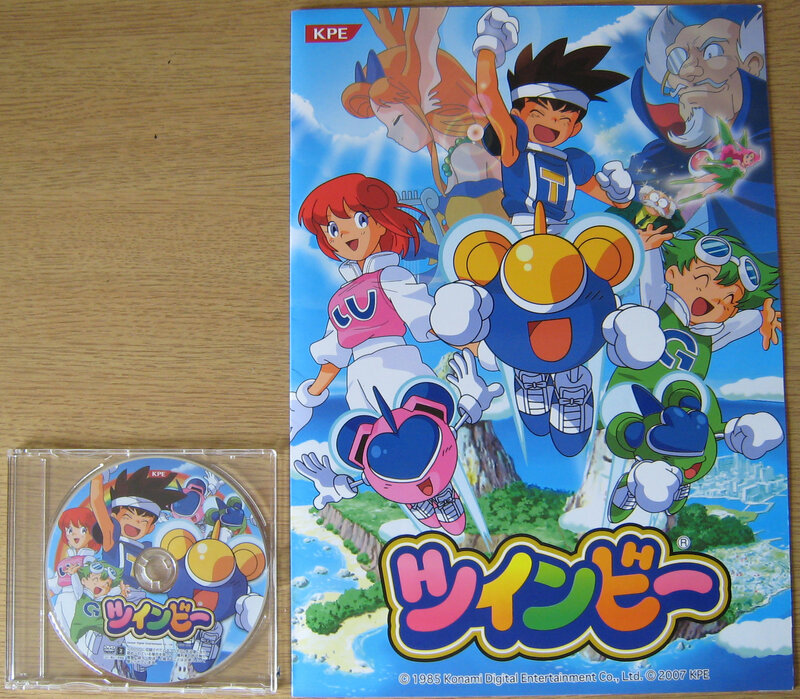 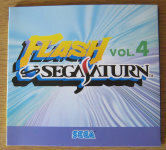 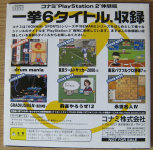 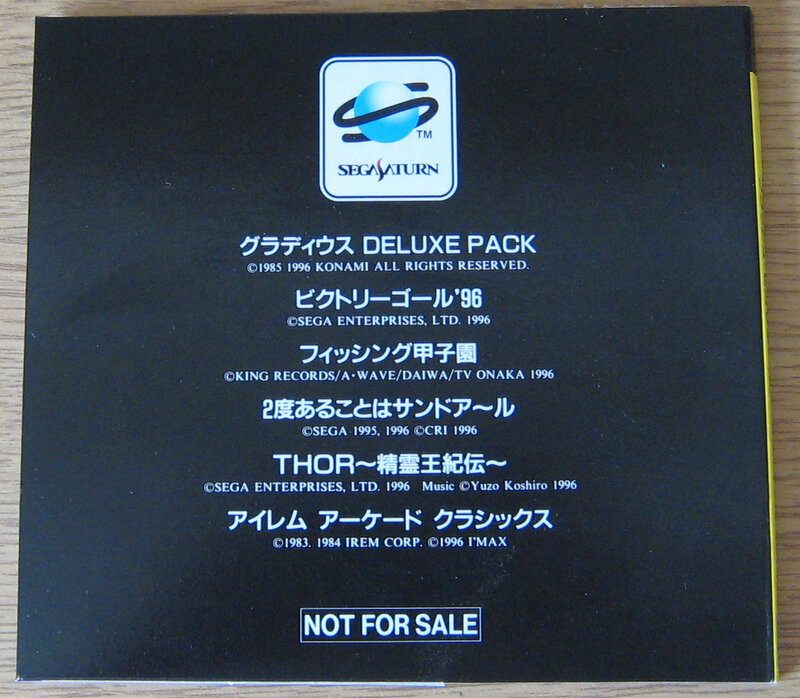 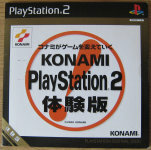 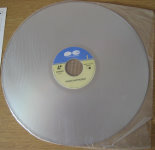 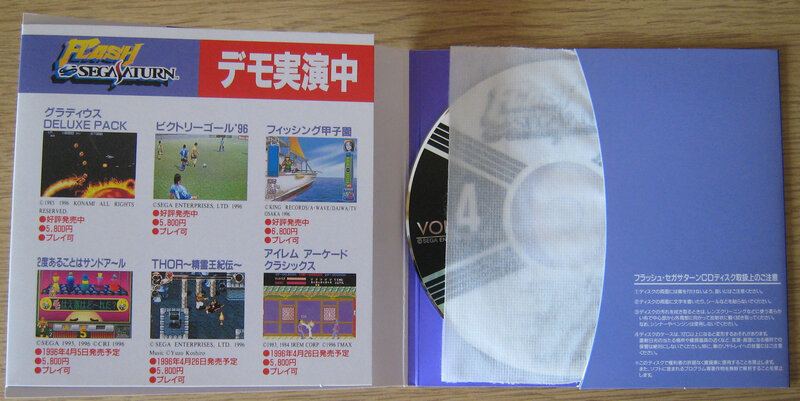 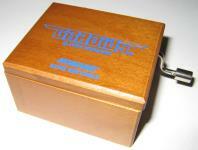 This game was released in a carboard box, because of this the game is quite rare, I only managed to find the CD only. 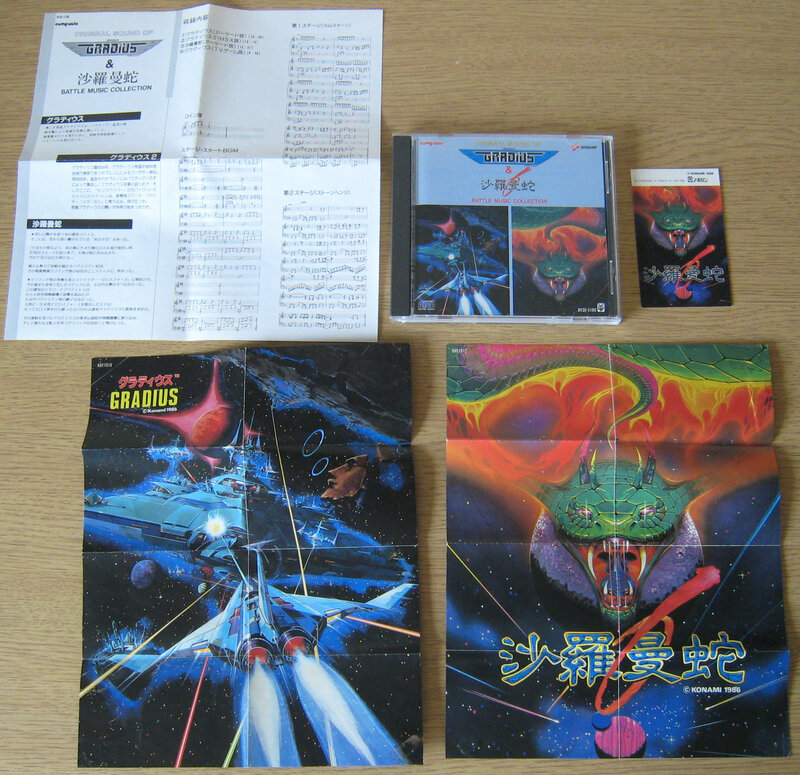 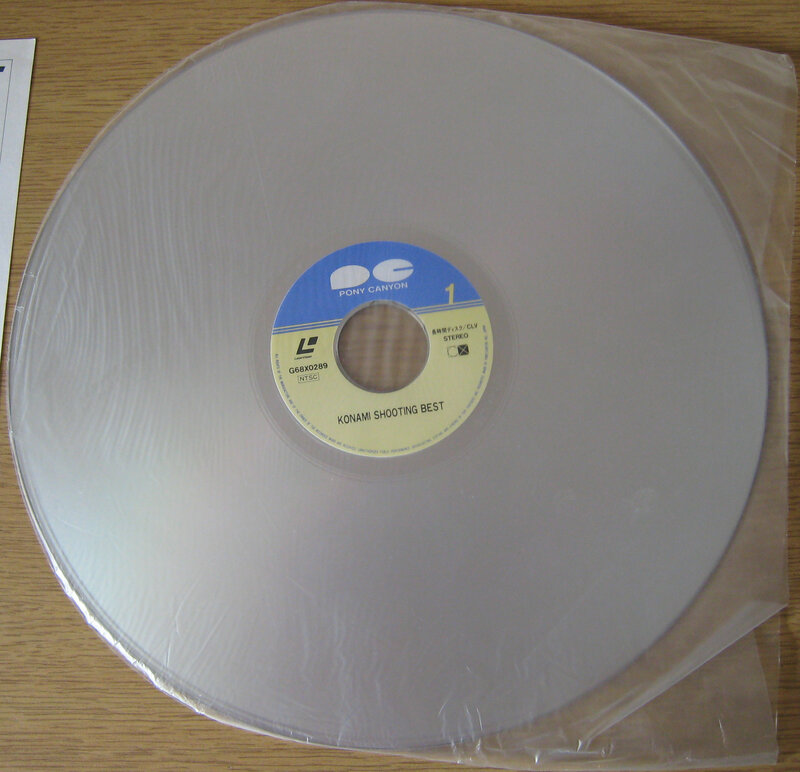 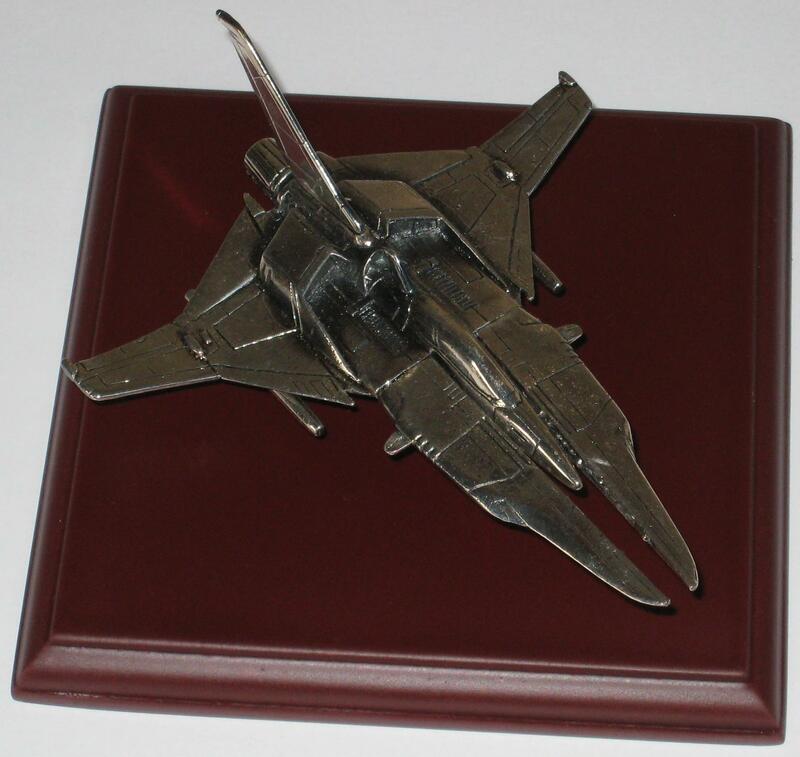 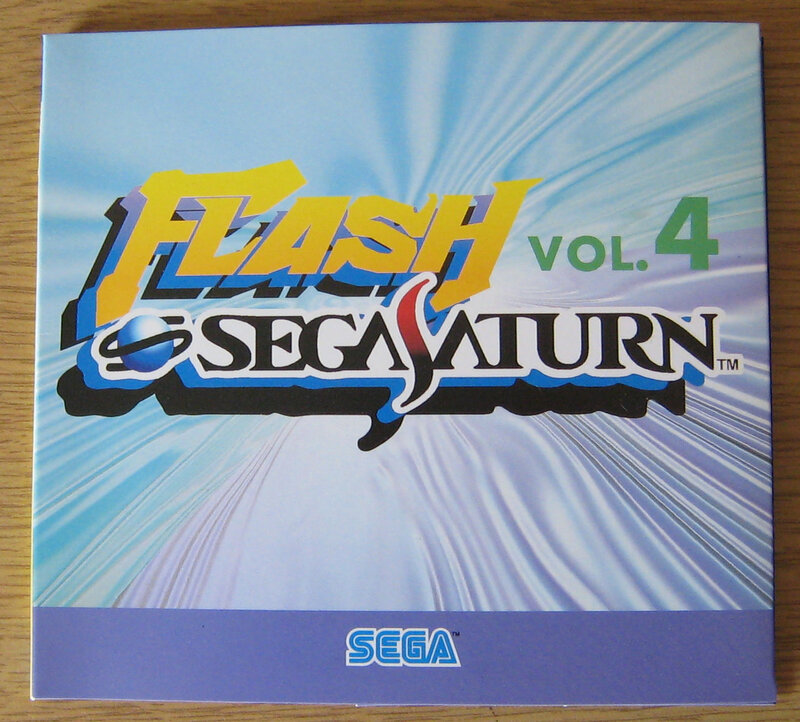 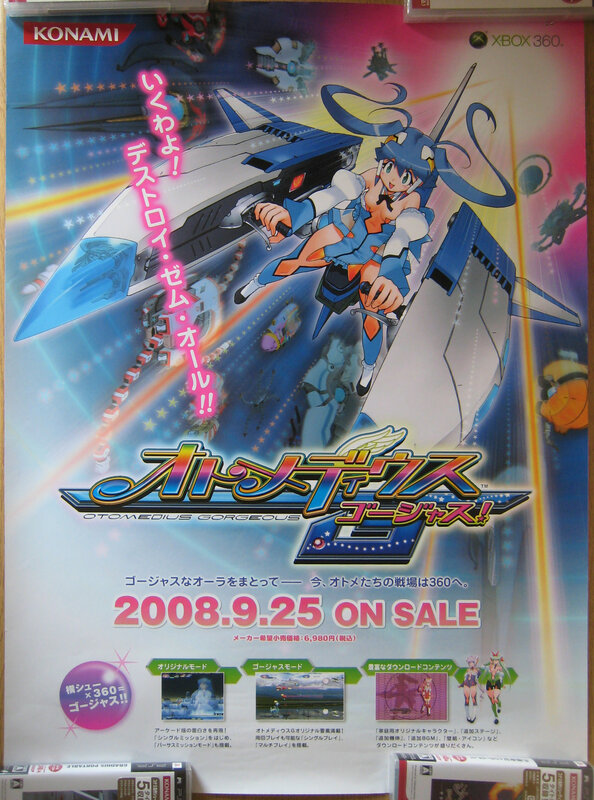 This was a promotional item that wasn't available in the shops but only directly from King Records by sending in tickets from three King Records Gradius CDs. 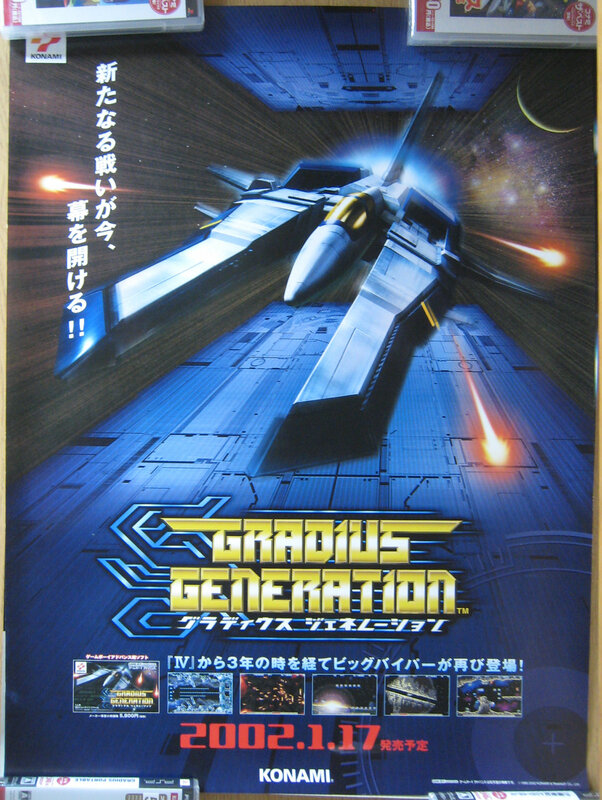 It plays 15 seconds of the ending tune "Farewell" from Gradius II GOFER no Yabou. 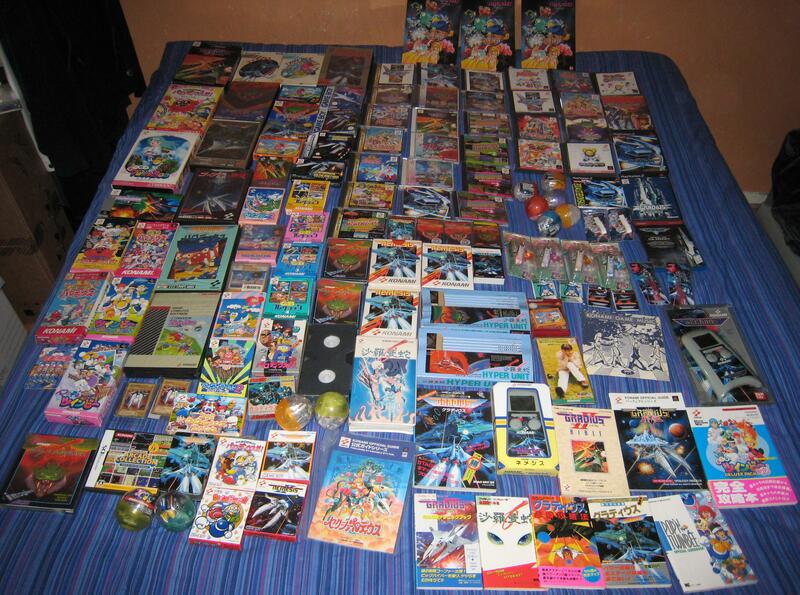 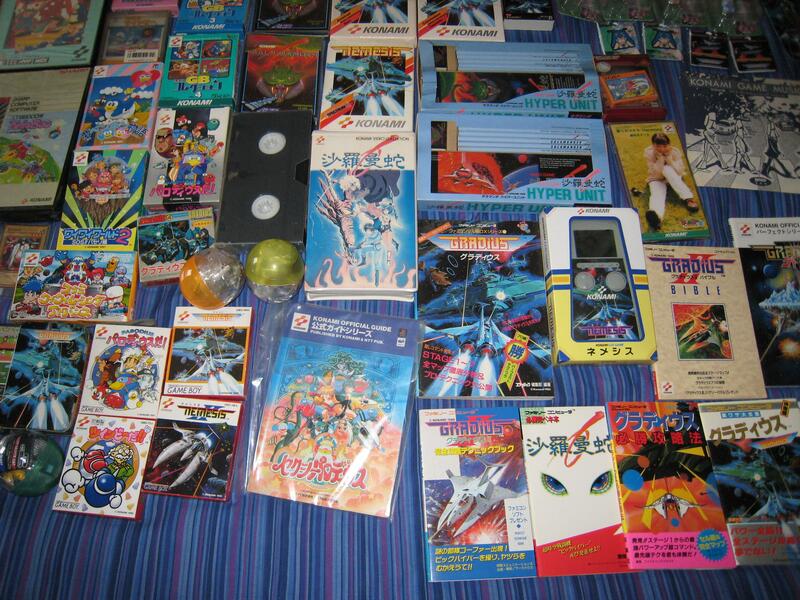 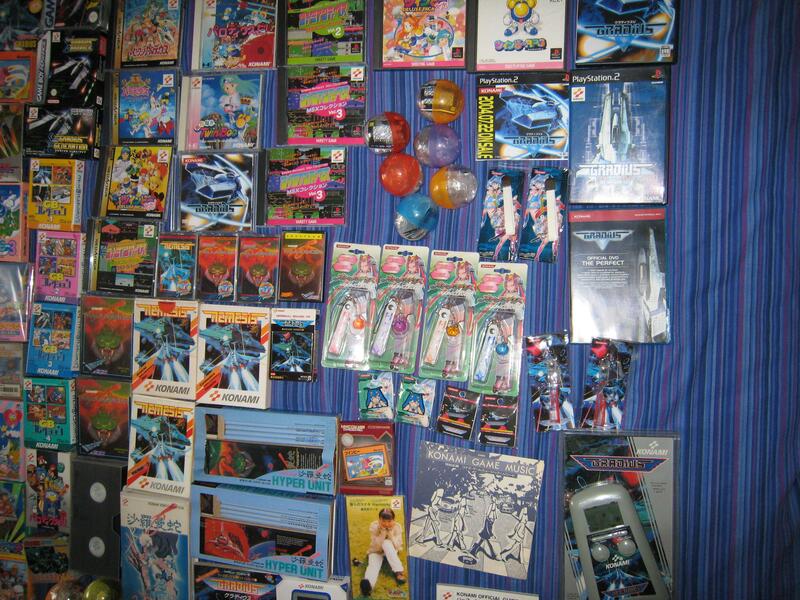 The latest photo of my collection of Gradius related merchandise, funny how it seems so much more when it's all laid out on my Super King size bed (6 foot by 6 foot 6inchs). 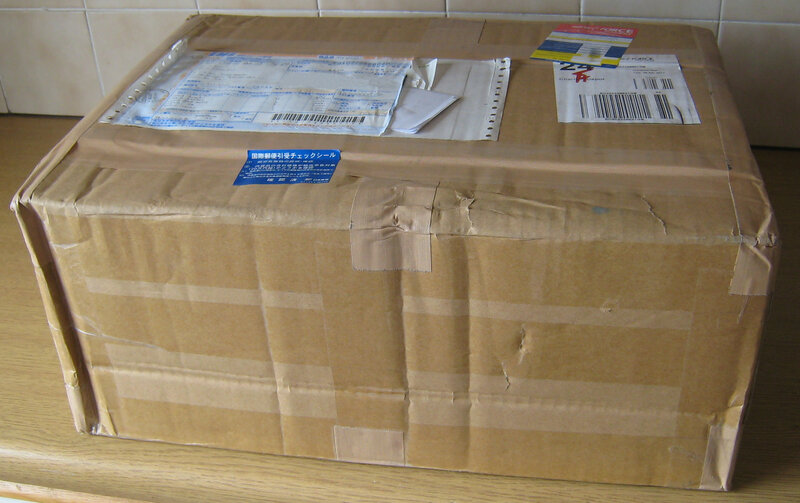 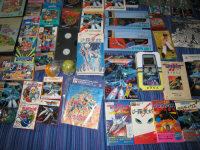 Items not shown in the photo are the Six Vic Viper model kits, two MMS figures for Otomedius (Erul Tron & Aoba Anoa), the four PlayStation Portable Collections. 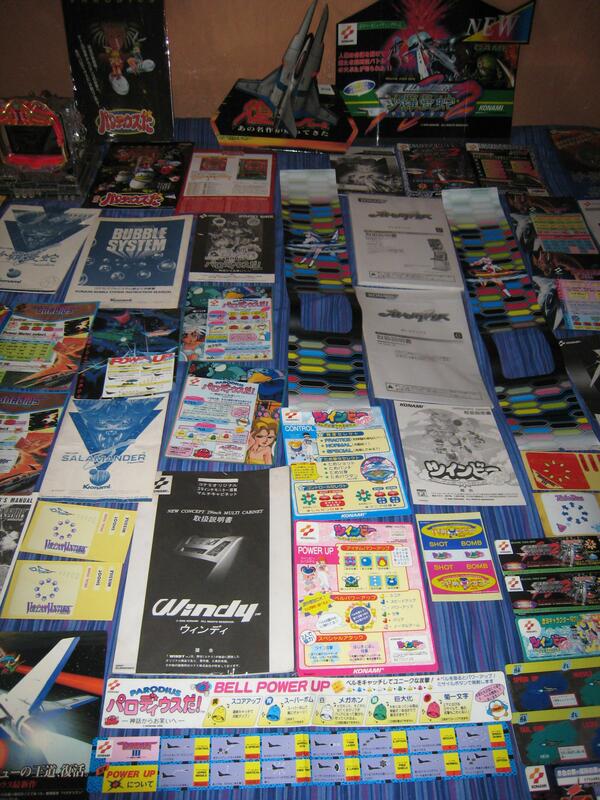 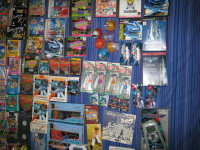 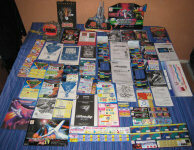 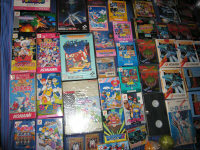 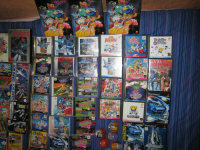 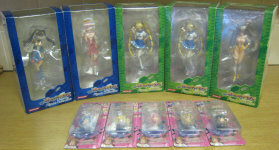 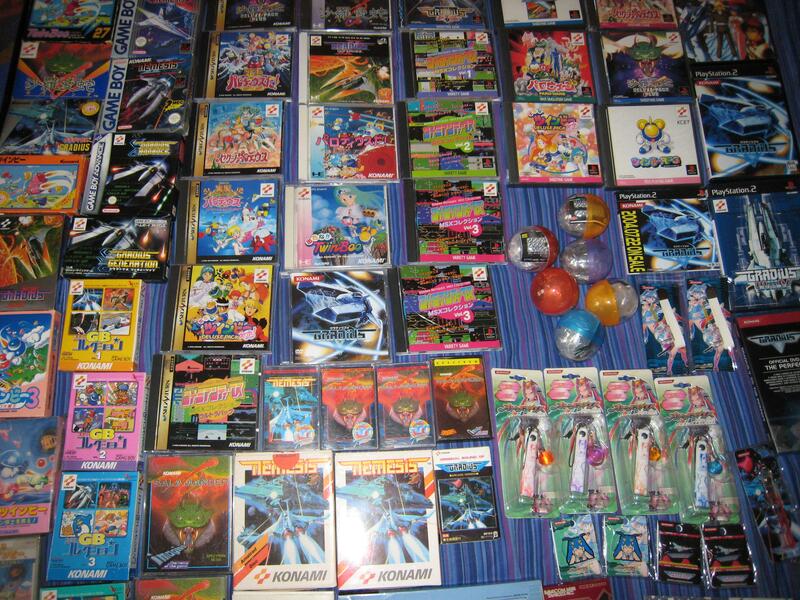 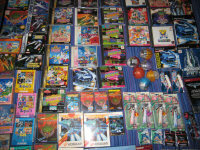 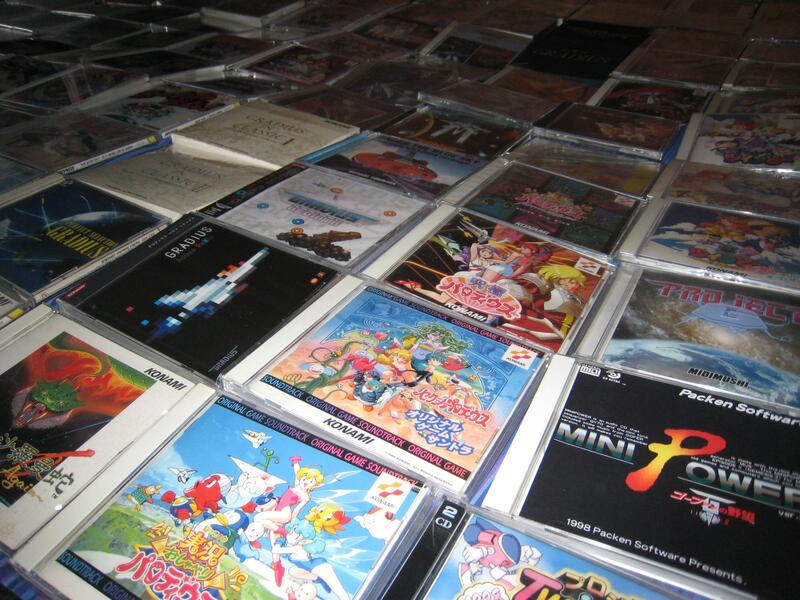 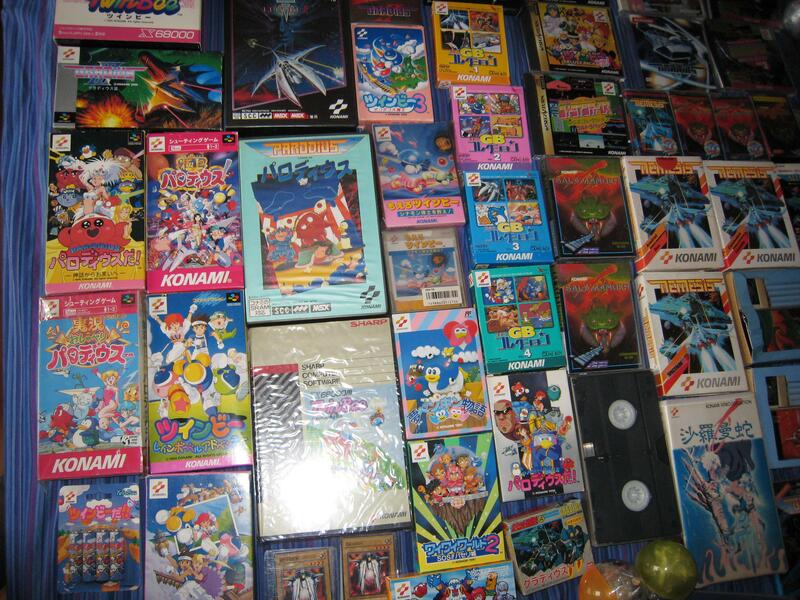 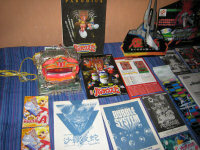 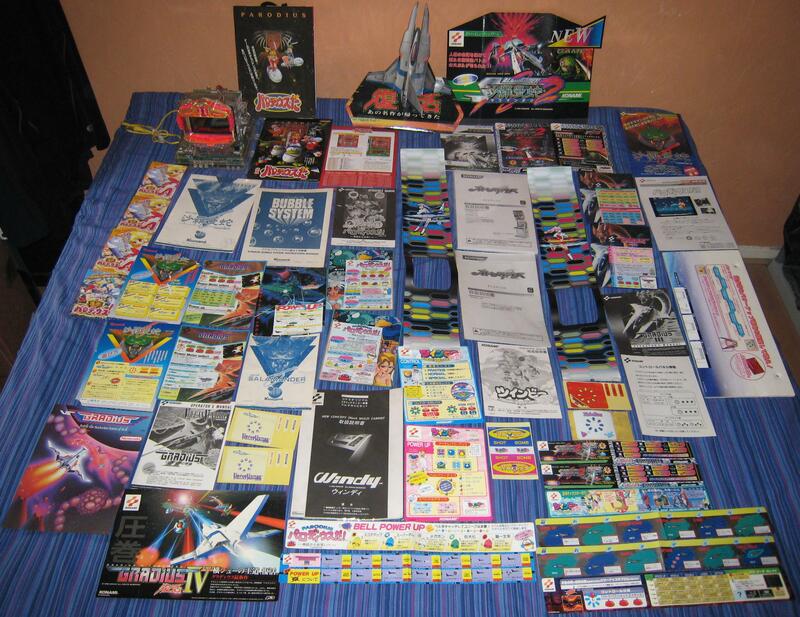 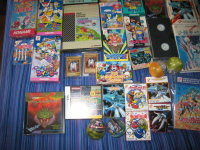 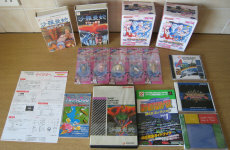 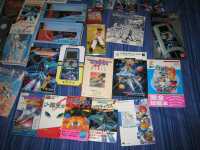 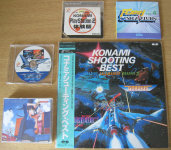 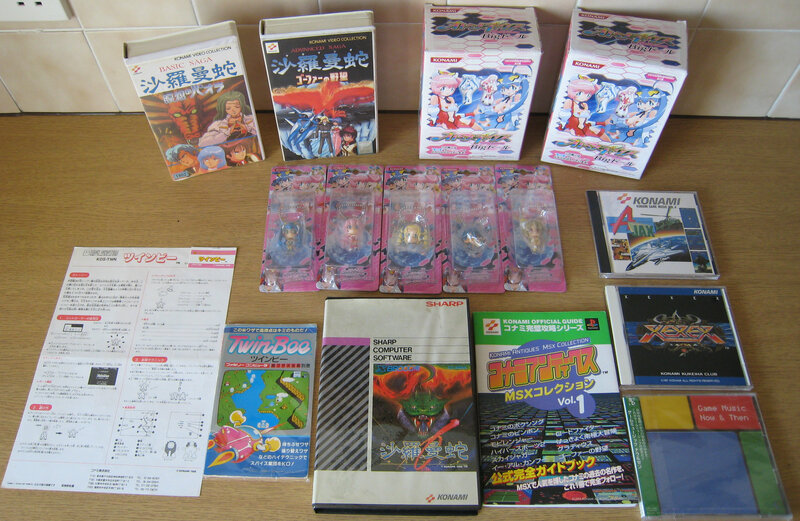 Here's a photo of the Arcade related items, all of these are originals, I've chosen not to show any colour copies here. 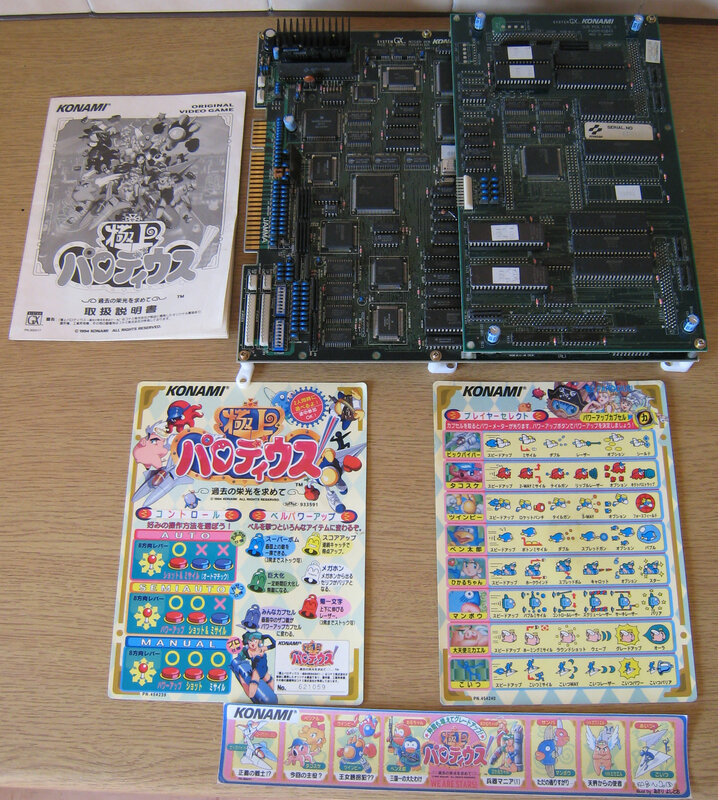 I decided not to show the arcade boards as I couldn't be bothered to unpack them and to be honest they are just printed circuit boards (PCB's) anyway. 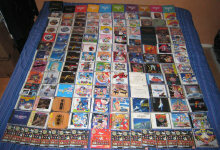 Over one hundred music CD's. 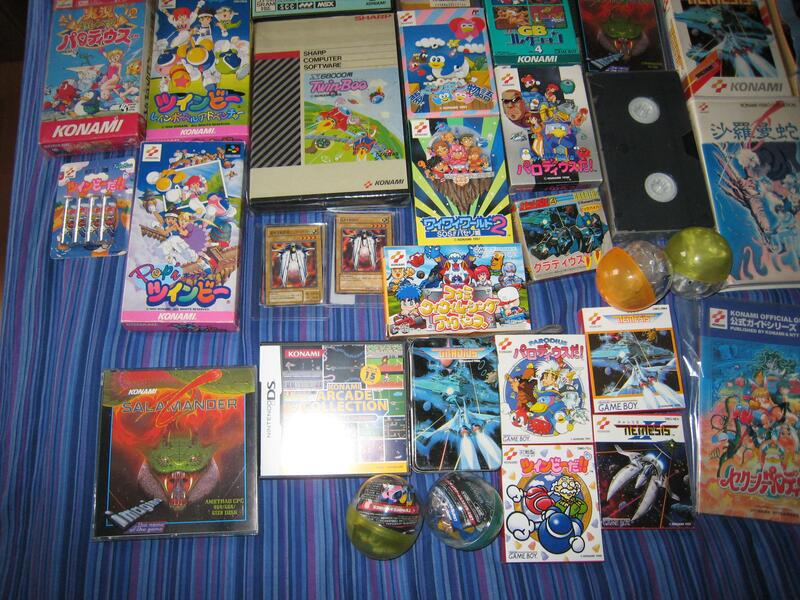 On the left are the items I'm missing from the collection, on the right are the items I currently own. 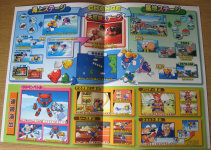 The PAL editions are Game Boy Color games unlike the Japanese releases.